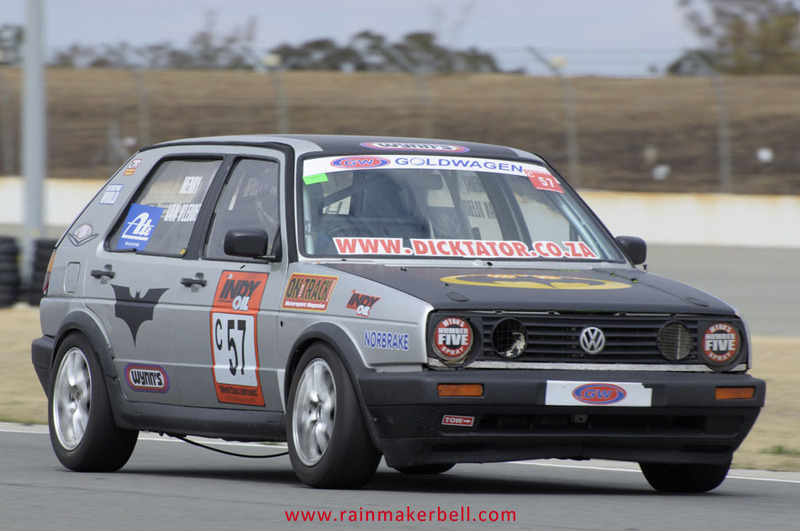 Friday morning at around 4am we left for Phakisa Freeway. 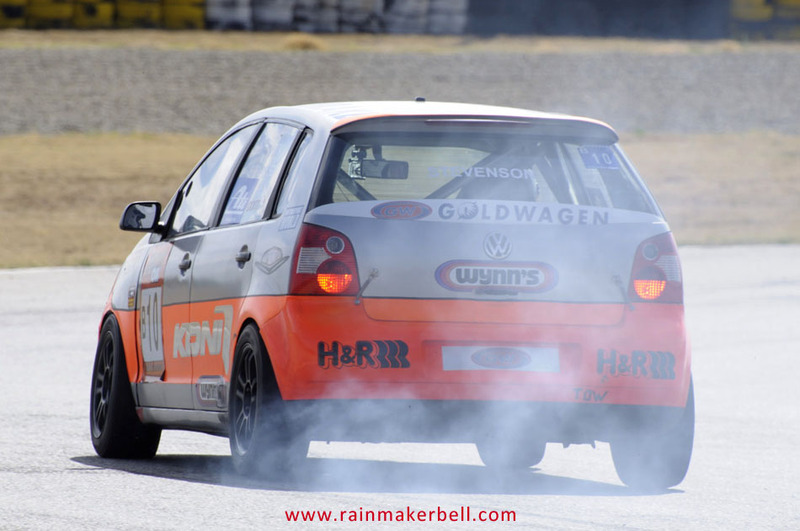 Most of the world on this side of the Vaal River was still fast asleep; except if you were geared up for an exciting motorsport weekend and heading in the same direction. 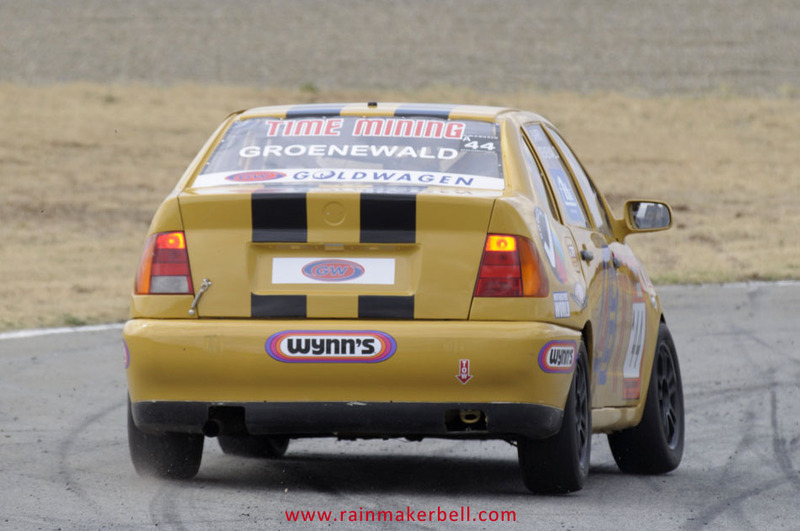 Rain came down in buckets, making the surface of our already deteriorating Gauteng roads almost unnavigable. 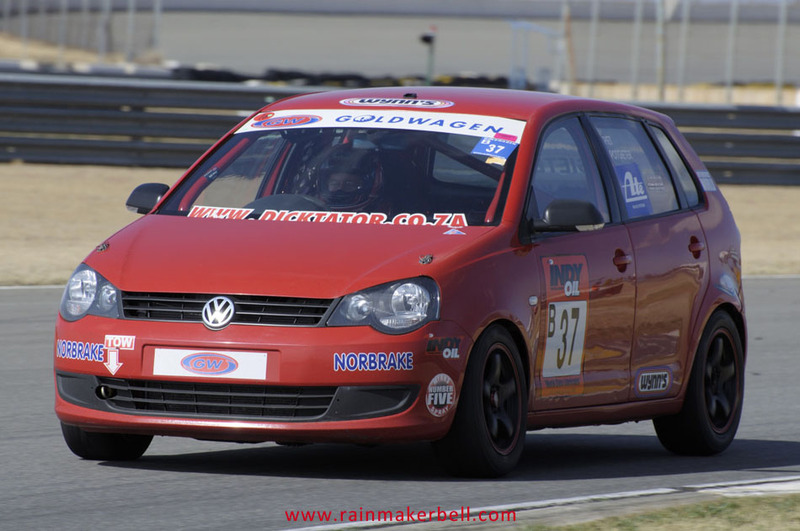 These days car dealerships should include an advanced driving course as part of every sale; not to teach you how to avoid L-drivers but to navigate around the sinkholes they call potholes on our roads. 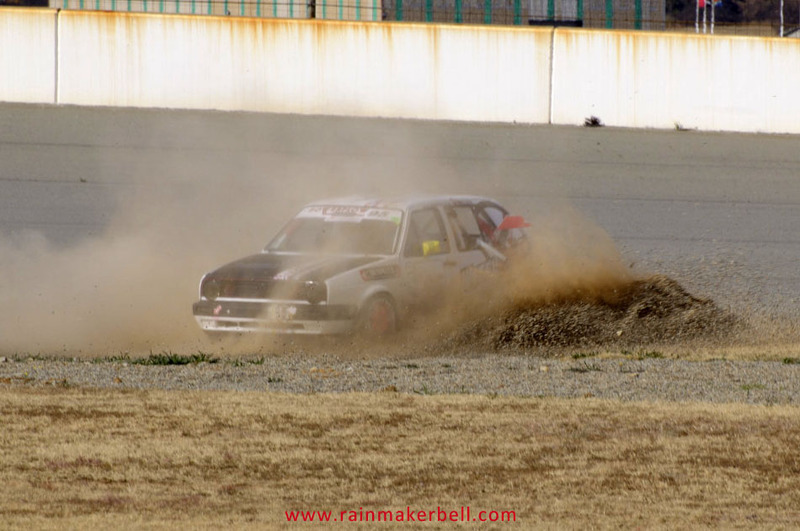 But today not even the state of our roads could dampen my spirit. 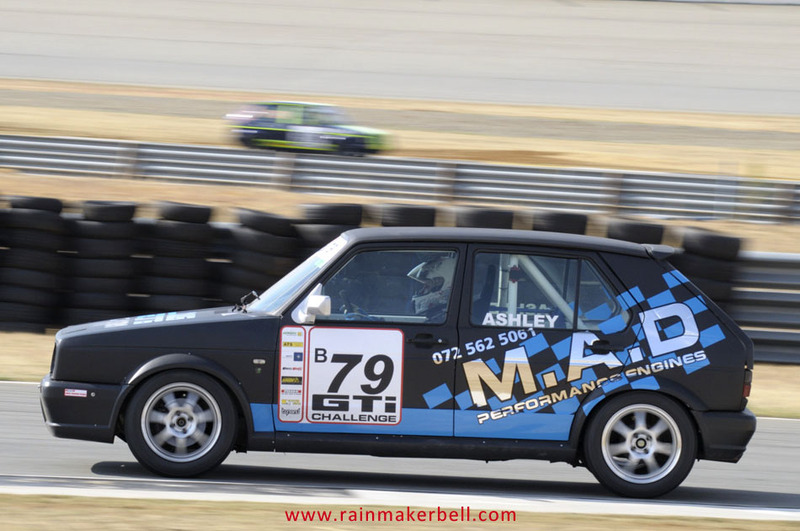 Next to the N1 highway, towards Phakisa, a huge billboard is watching over passing traffic. 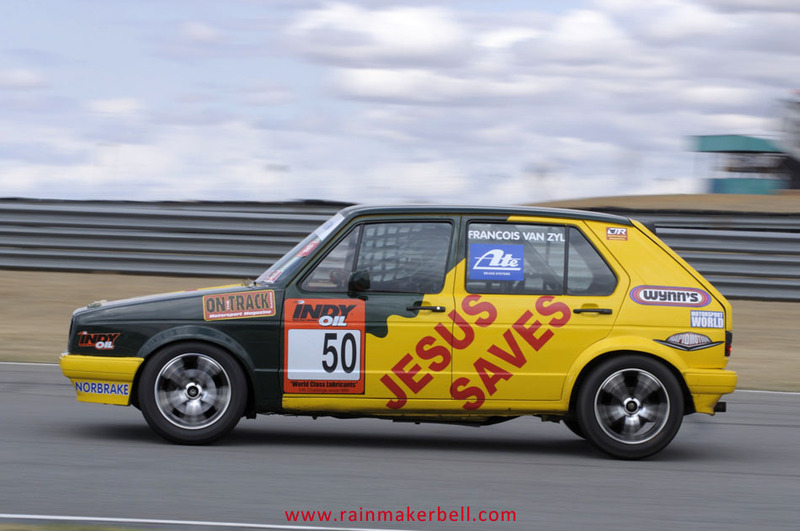 Many a motorist must have seen it—Captain Kirk smiling down at the world. 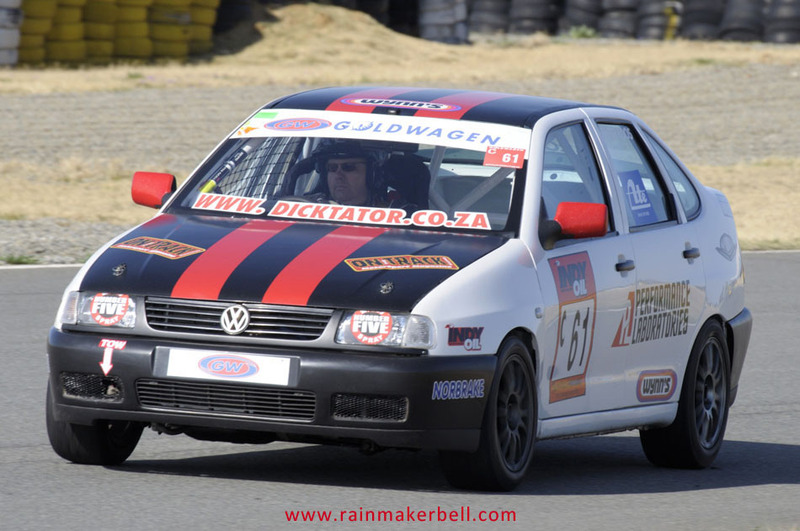 With a knowing smile I saluted him; this was going to be a great motorsport weekend. 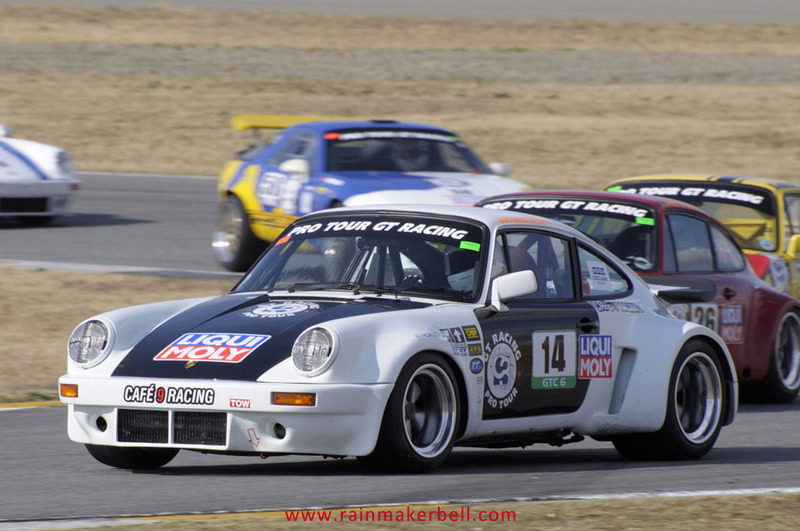 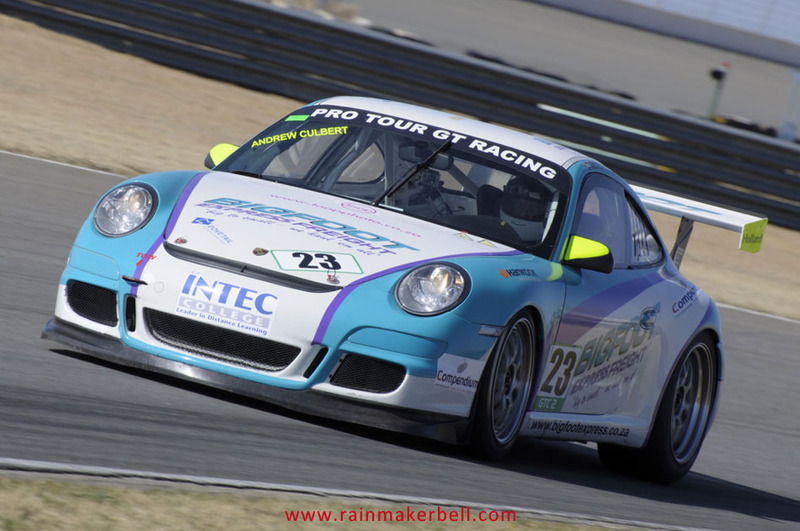 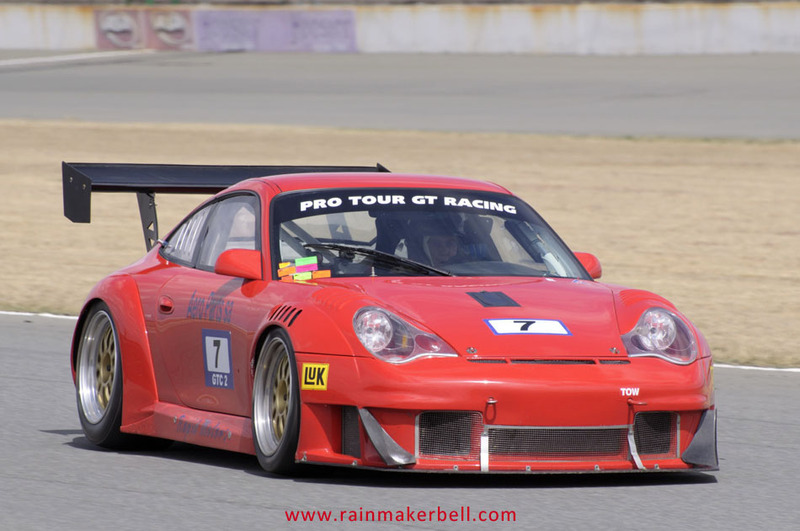 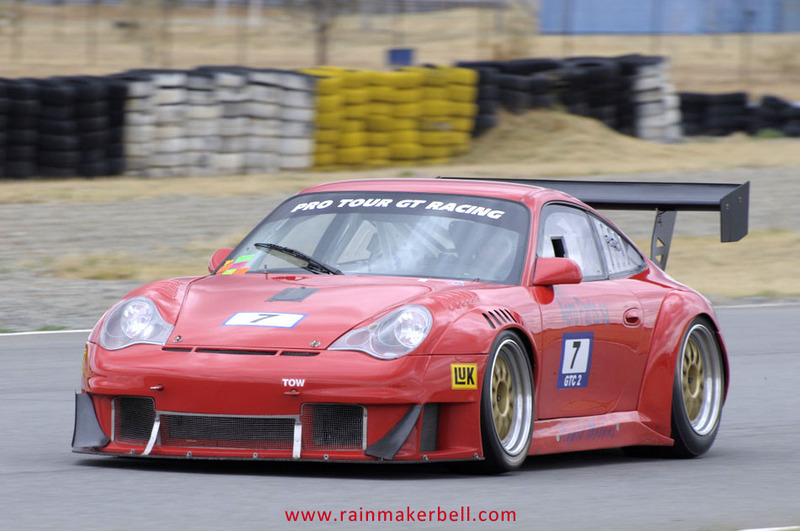 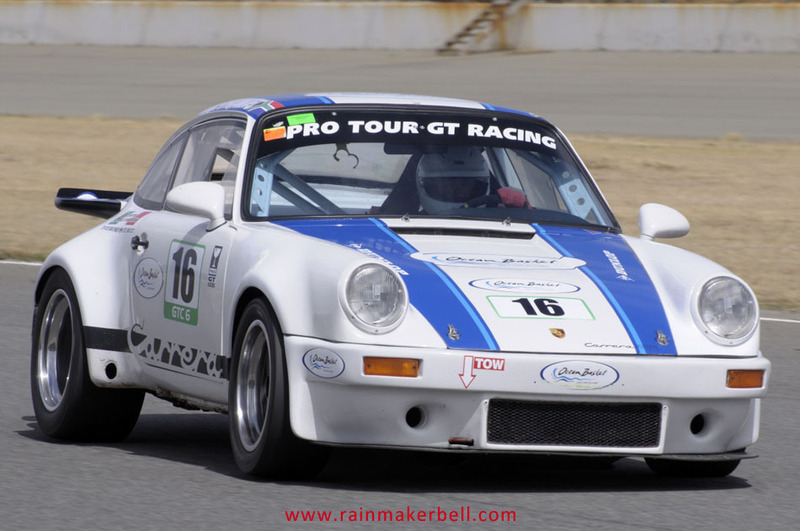 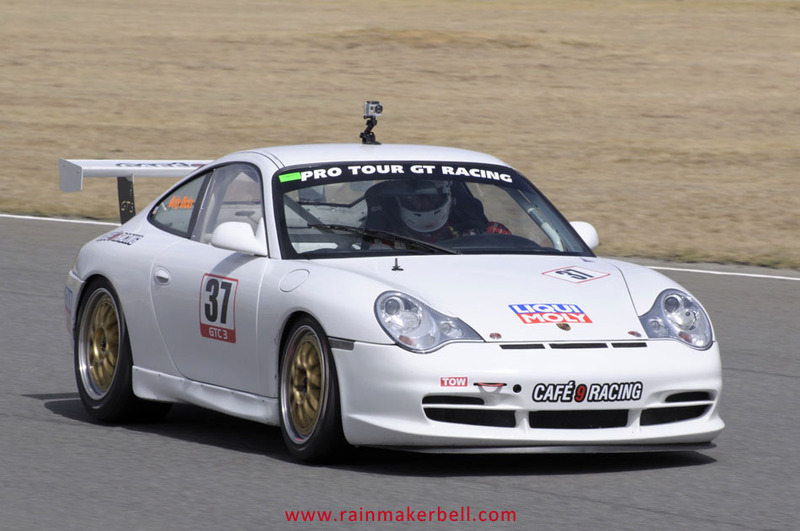 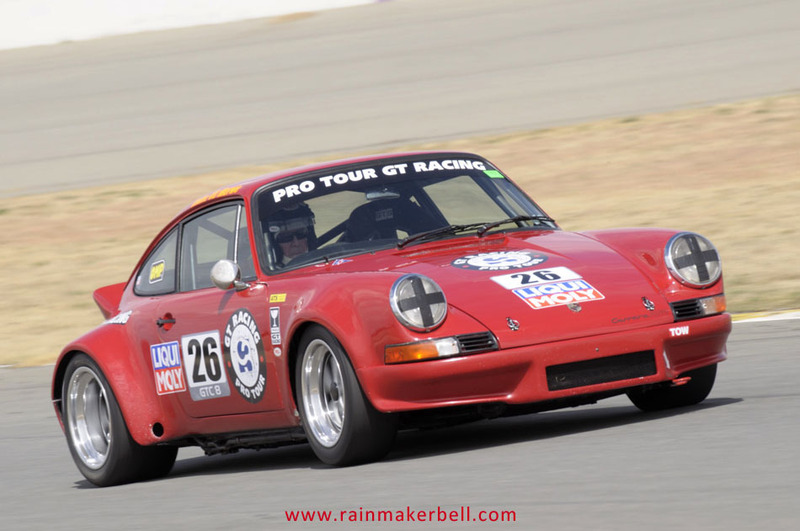 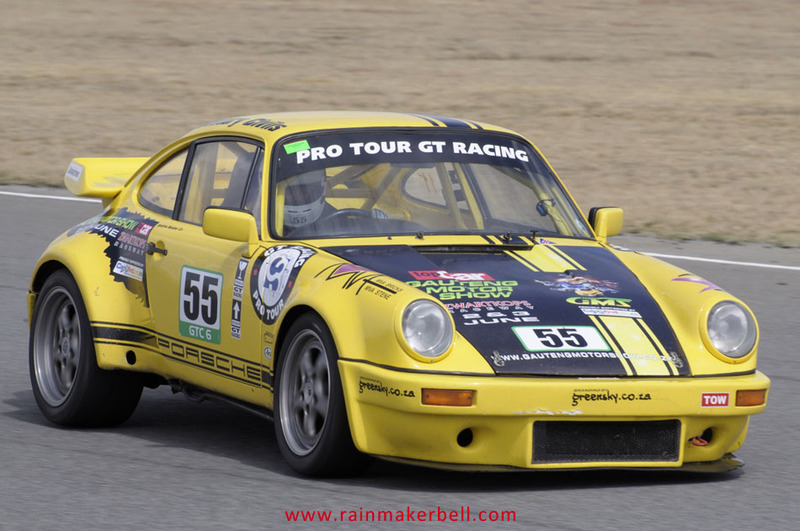 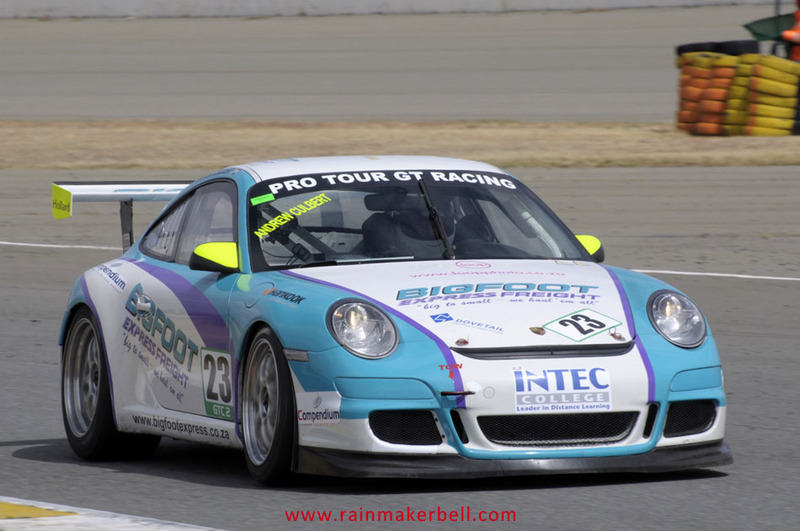 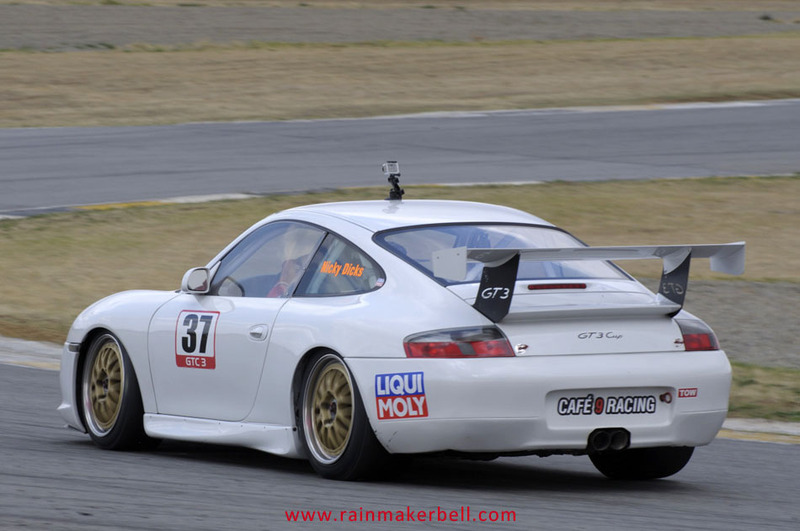 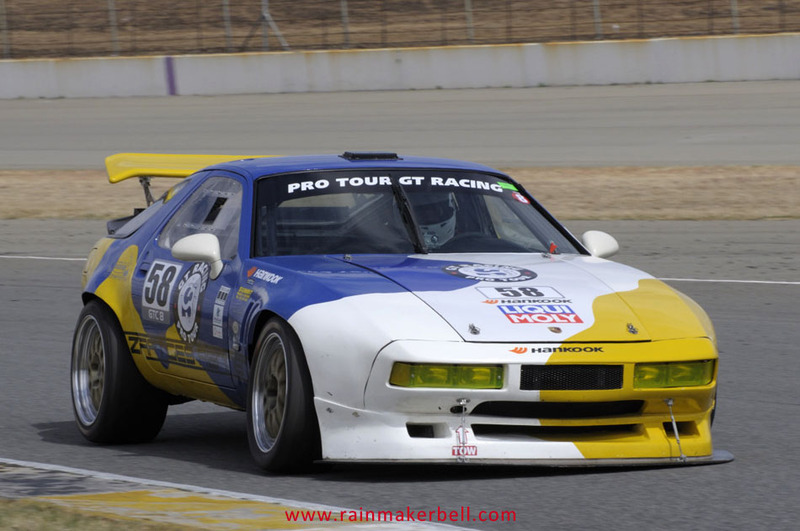 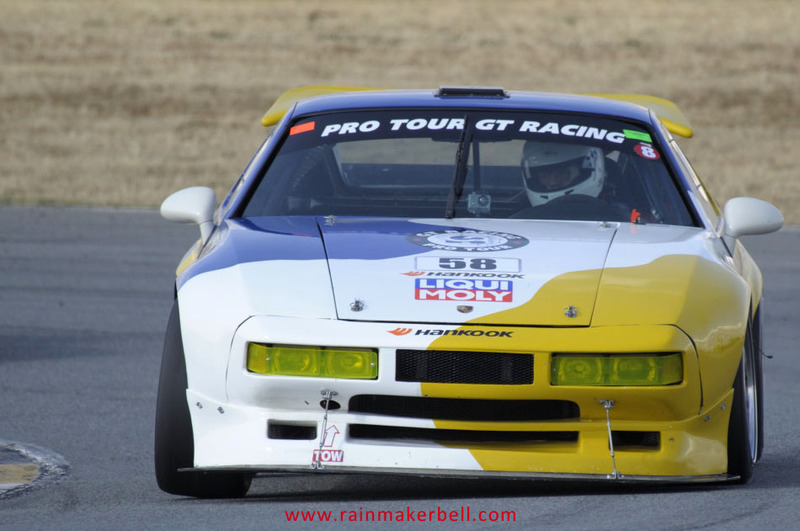 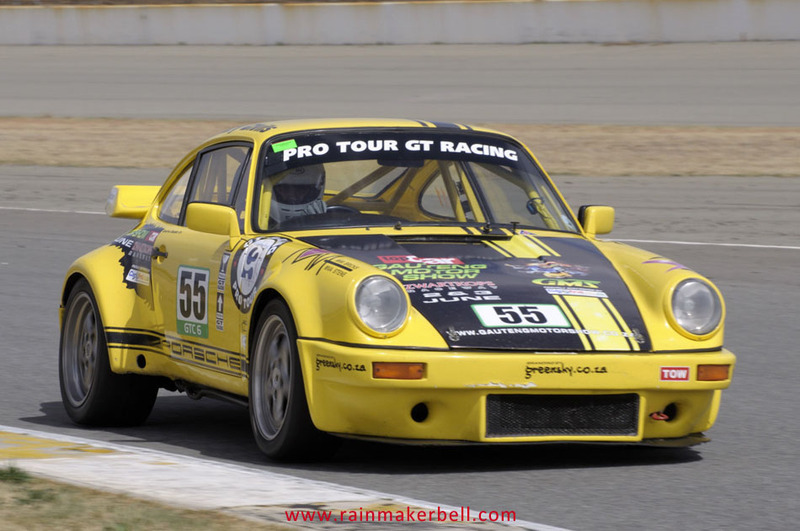 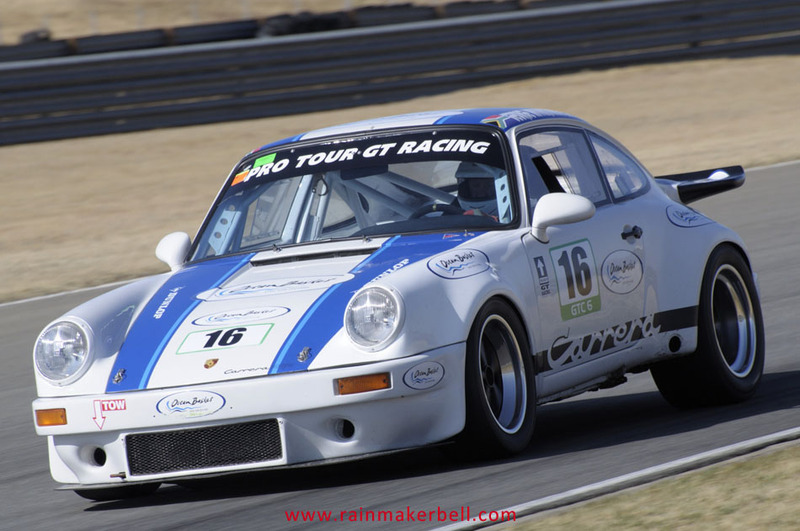 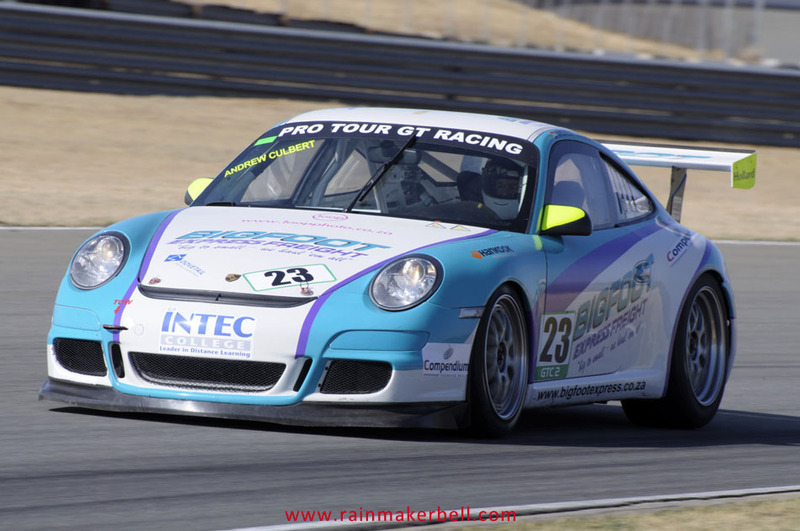 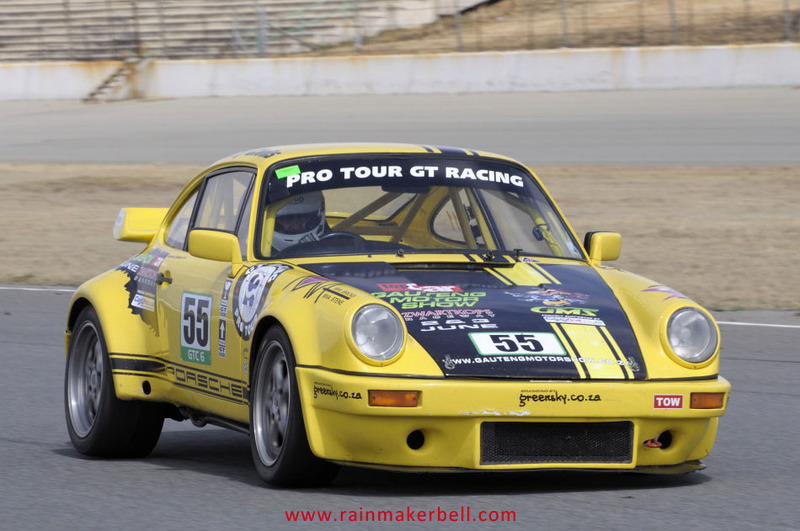 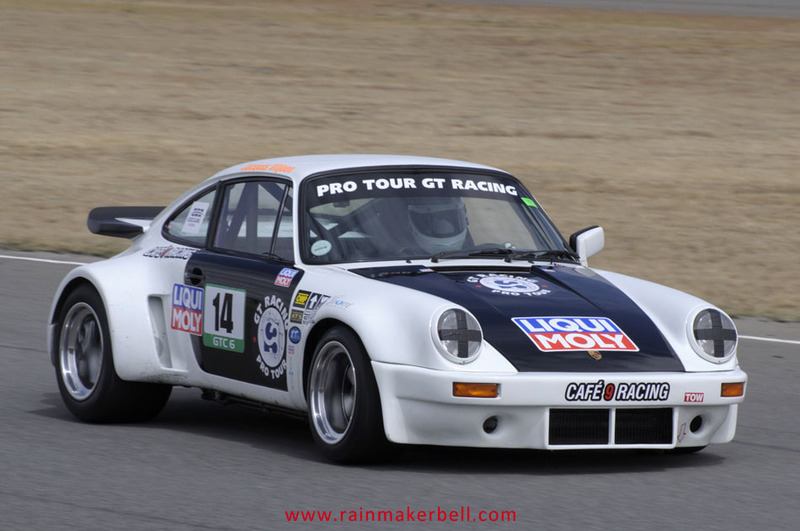 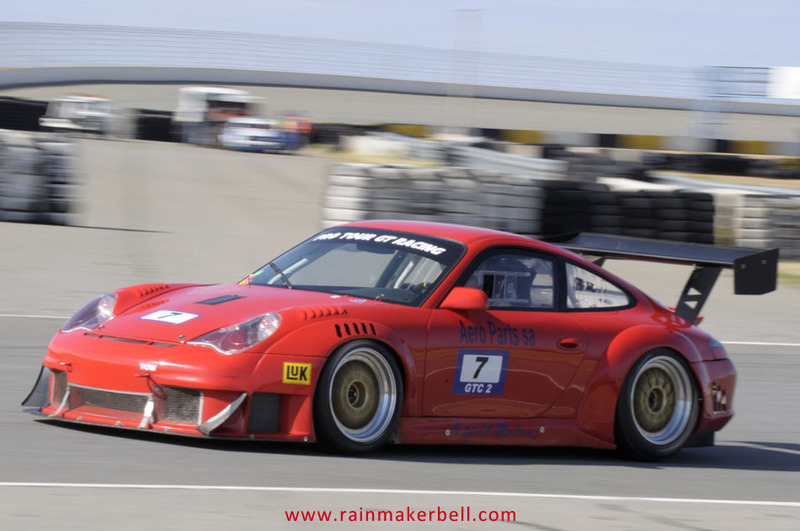 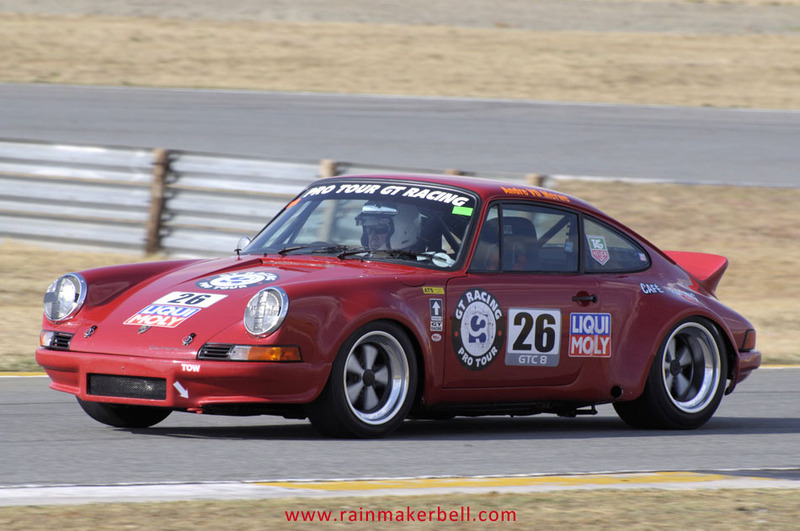 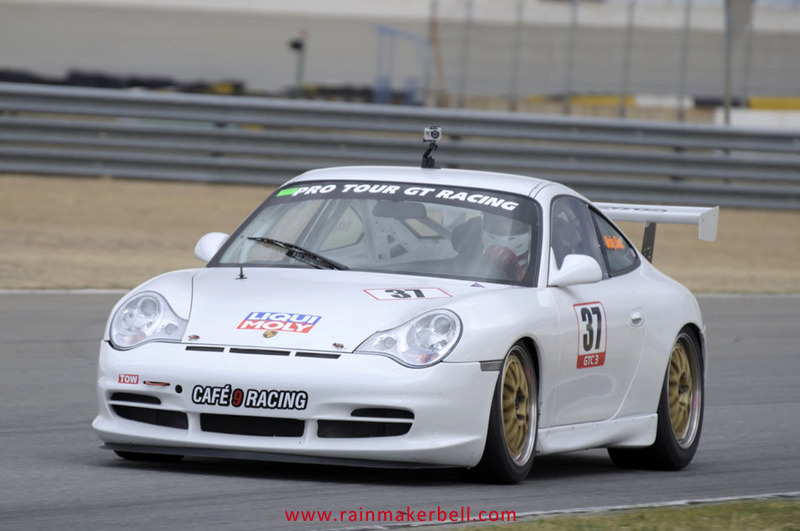 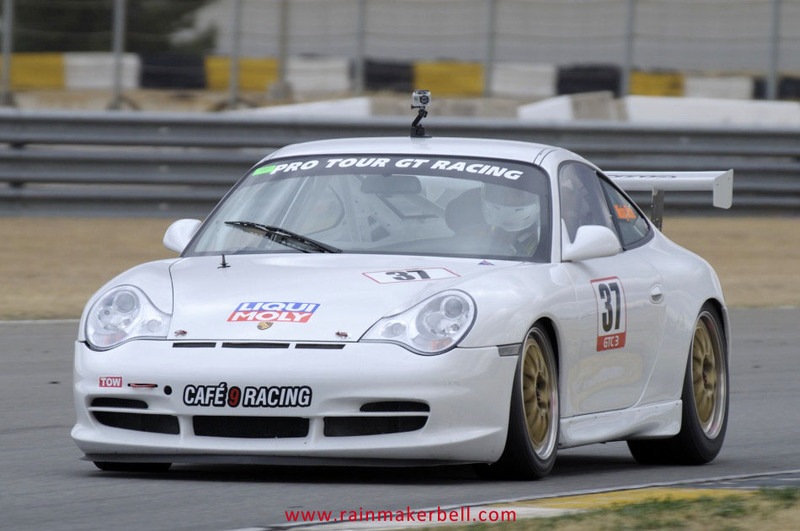 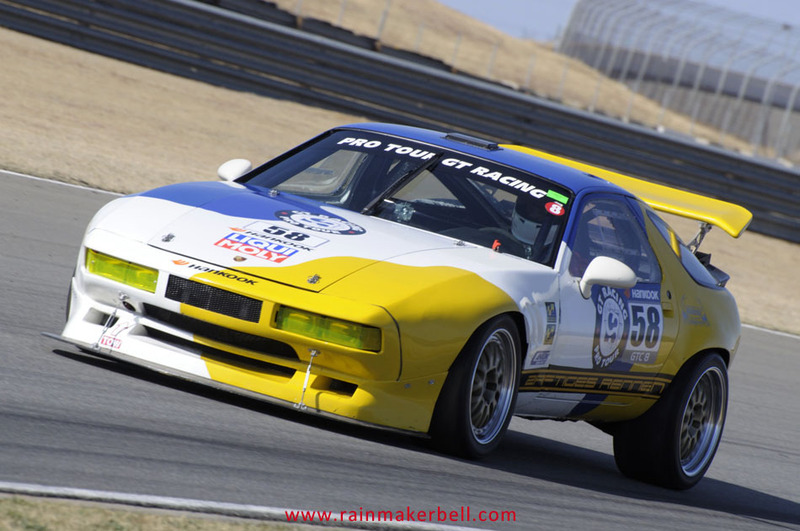 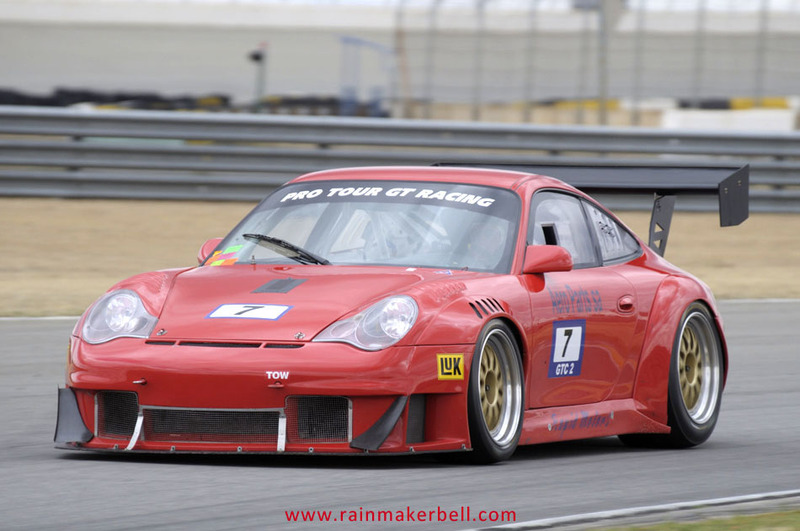 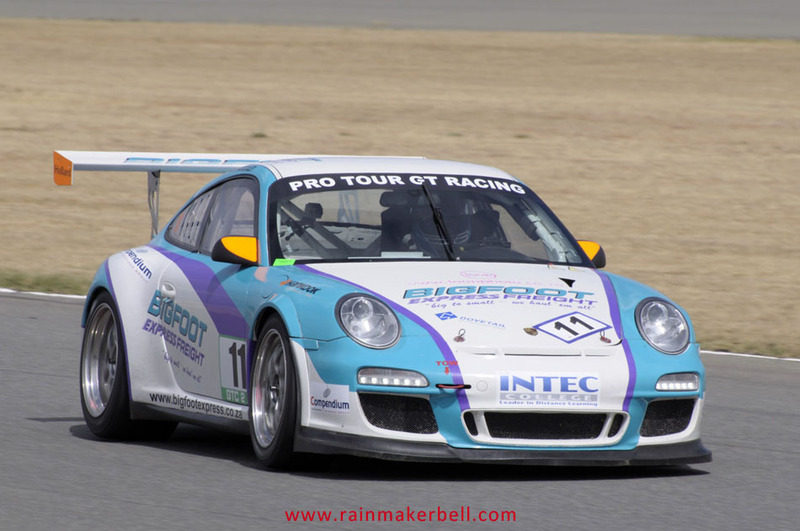 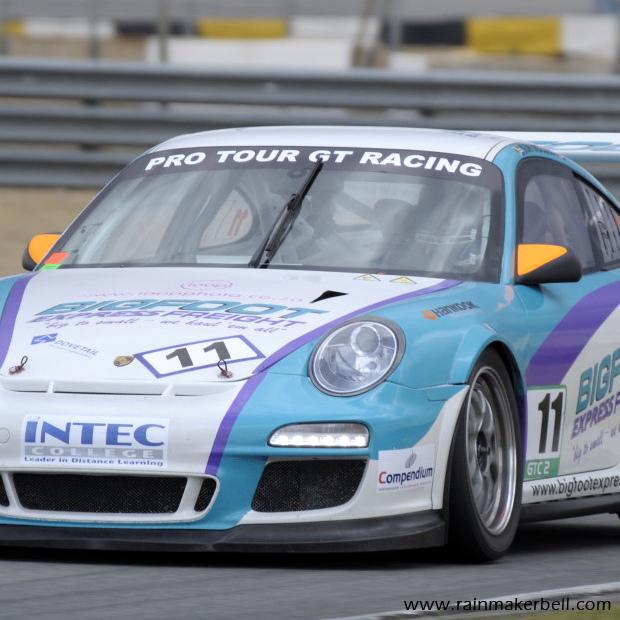 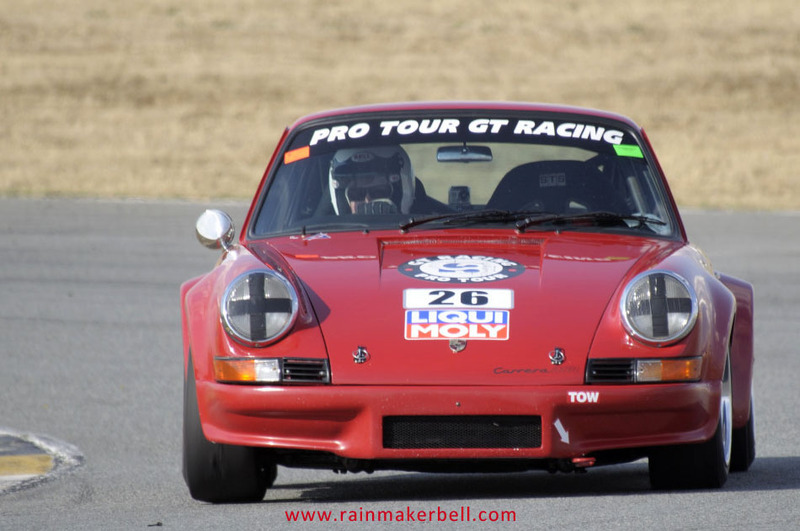 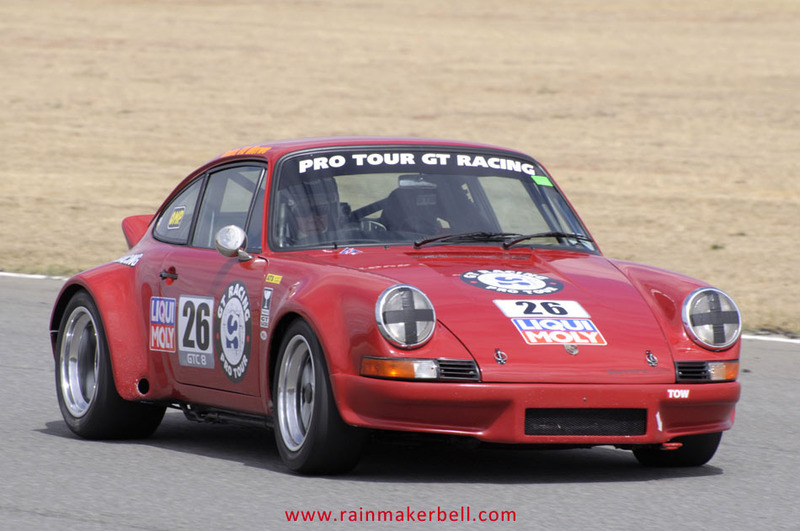 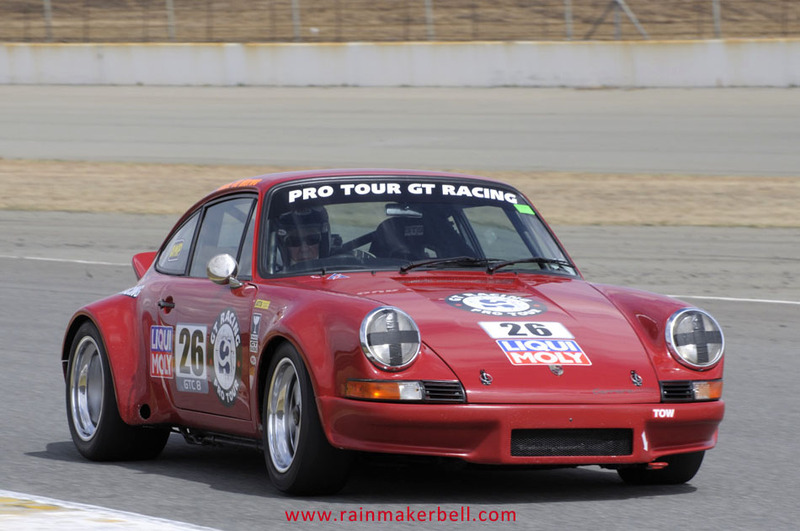 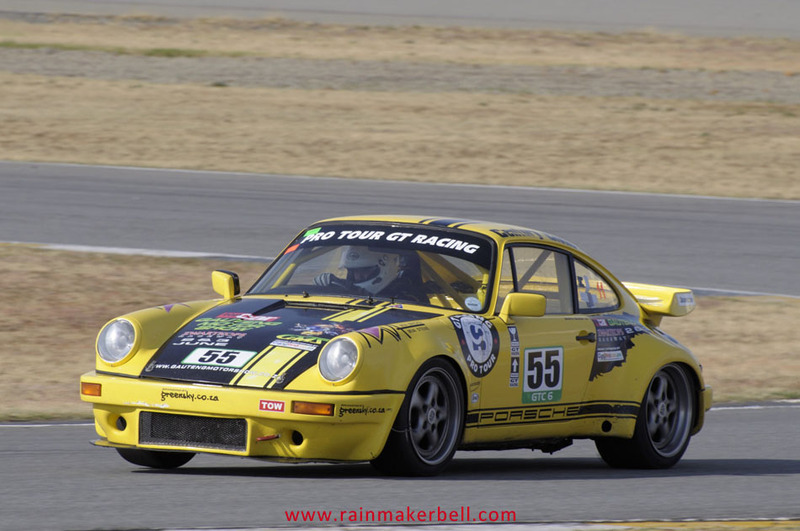 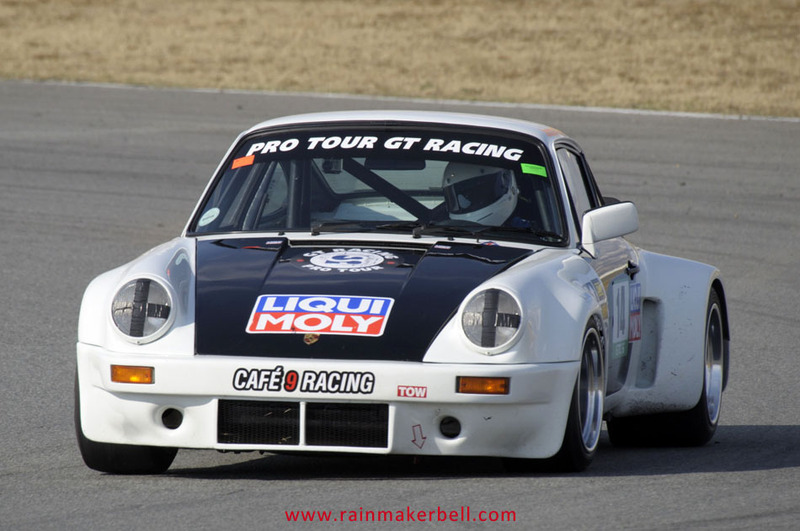 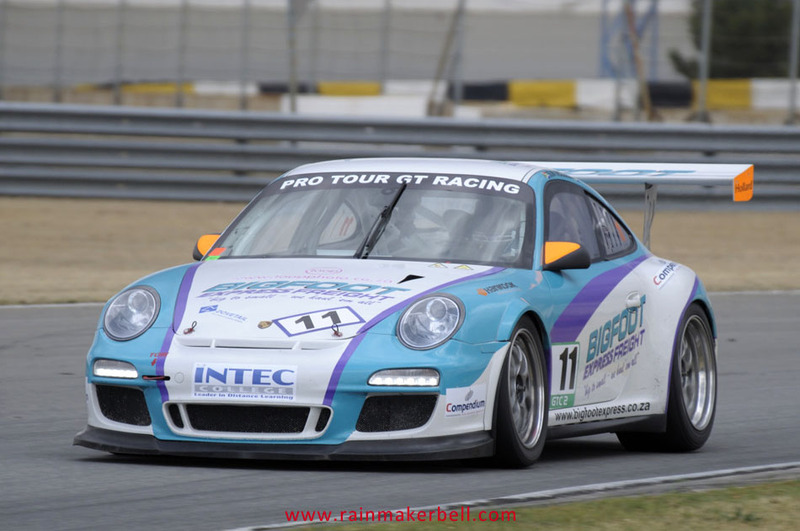 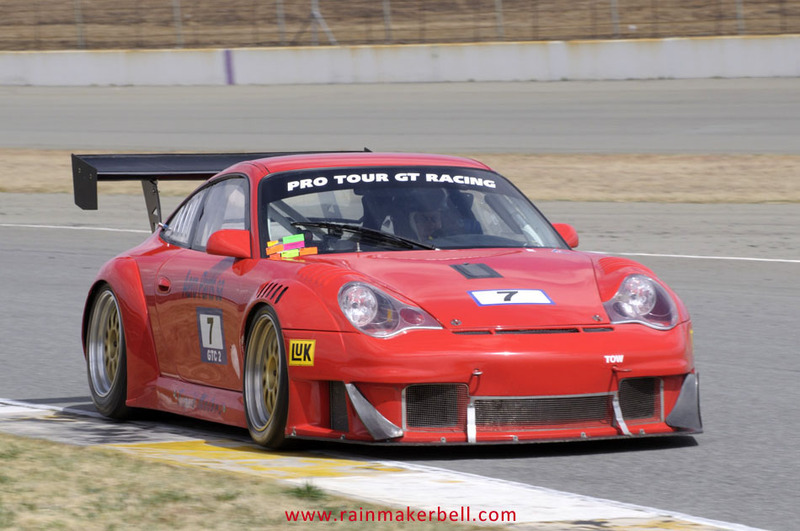 Rumour has it that the elusive Grand Wizard (Toby Venter) as well as Rod Cole-Edwardes #69 in his Porsche 993 GT2, would be making their track appearance at the seventh round of the Pro-Tour Motor Racing Road Show. 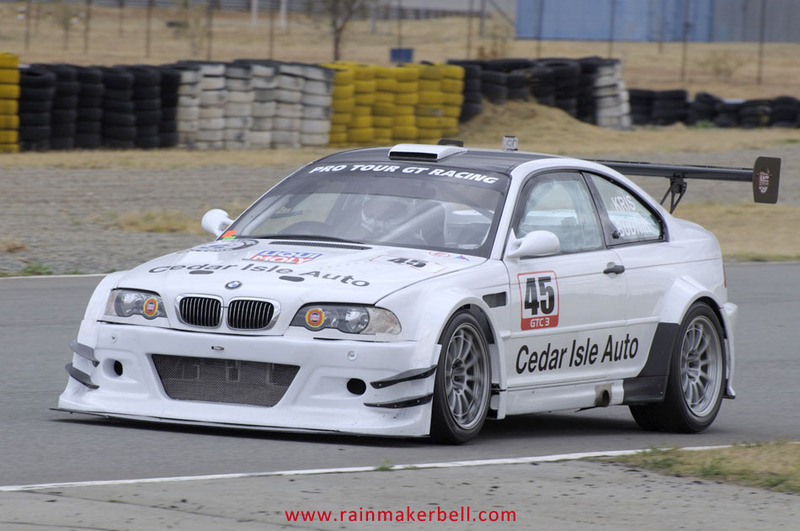 What a treat this will be for the thousands of cheering fans! 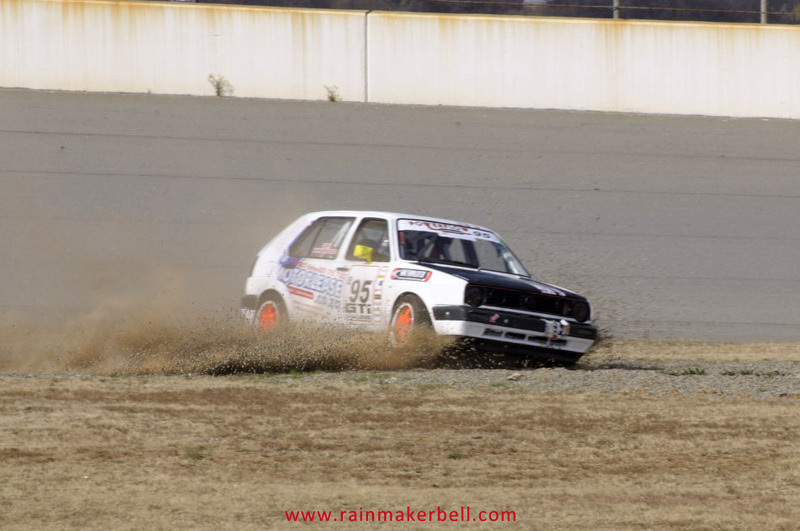 We pushed diligently forward, too blinded by our own excitement to suspect otherwise. 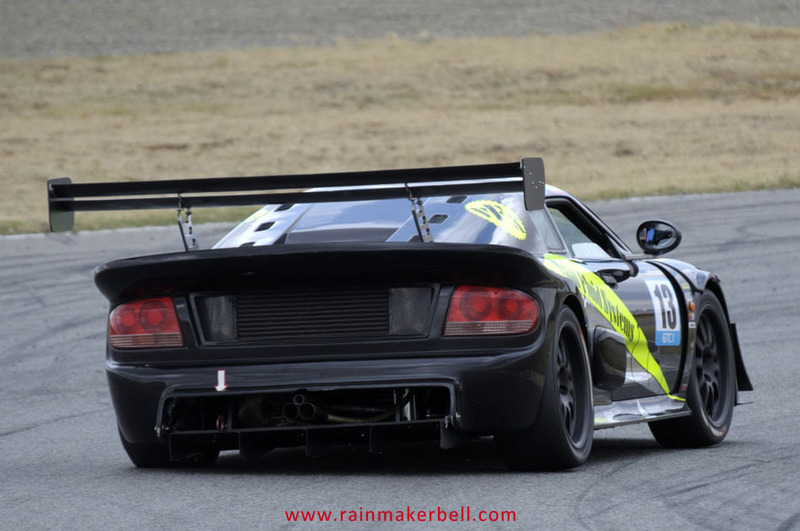 Overhead windy and ominous dark clouds proclaimed a different story (a story to be told another time). 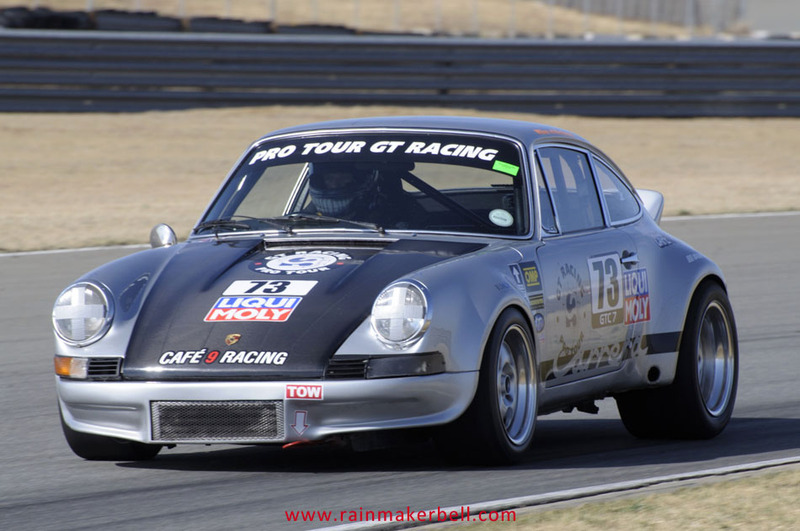 The C3 brotherhood of Willem (Porsche 911 RSR), Jacques (Porsche Carrera) and Andre (Porsche 911 RSR) will again have my undivided attention. 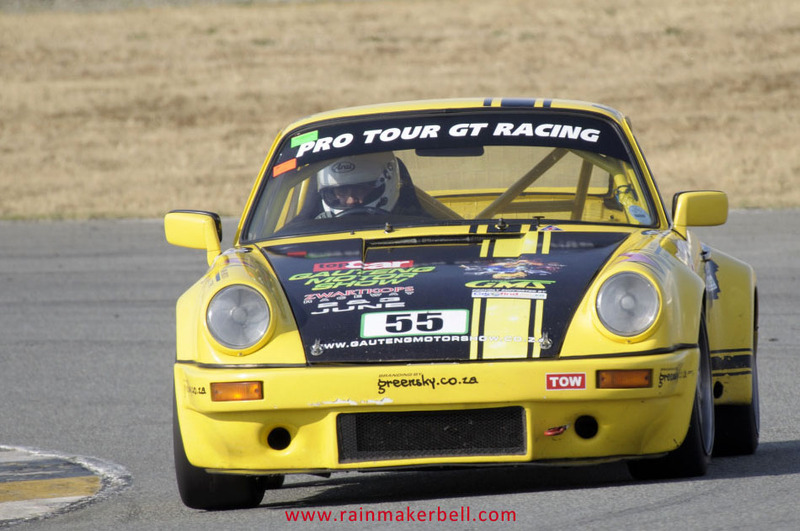 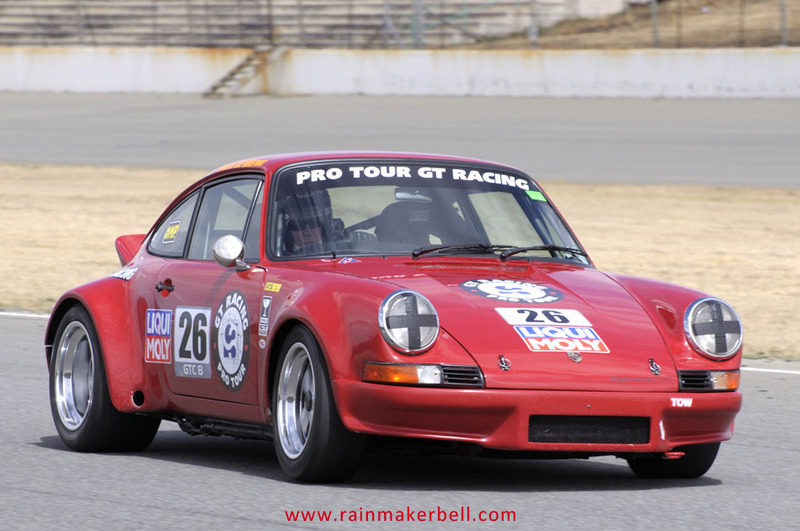 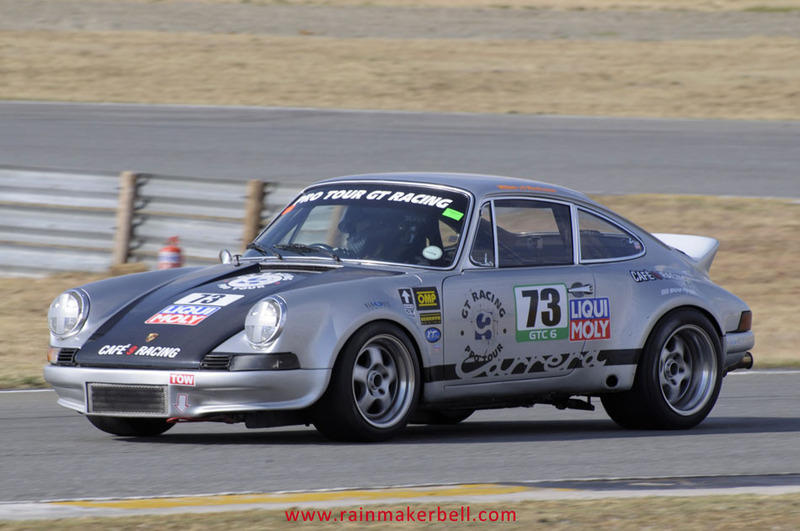 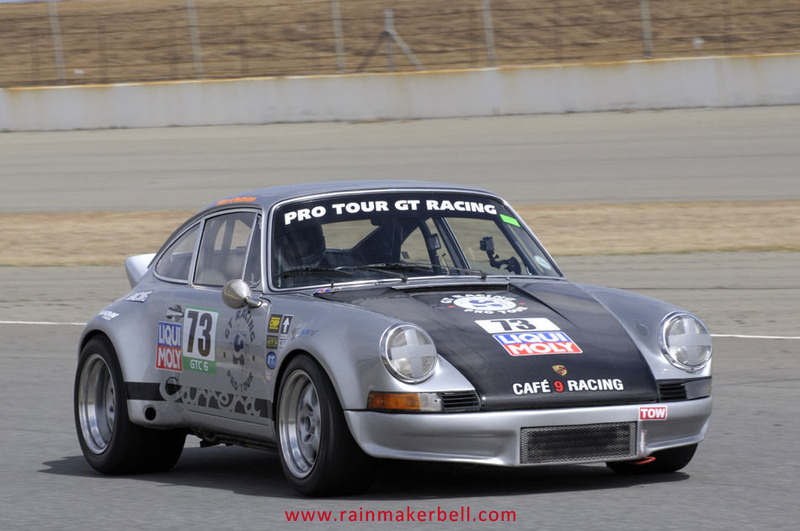 Willem #73 will be trying his best to take down George Avakoumides #16 (Porsche 911) and Andrie Bester #55 changing gears in a Porsche 911 SC. 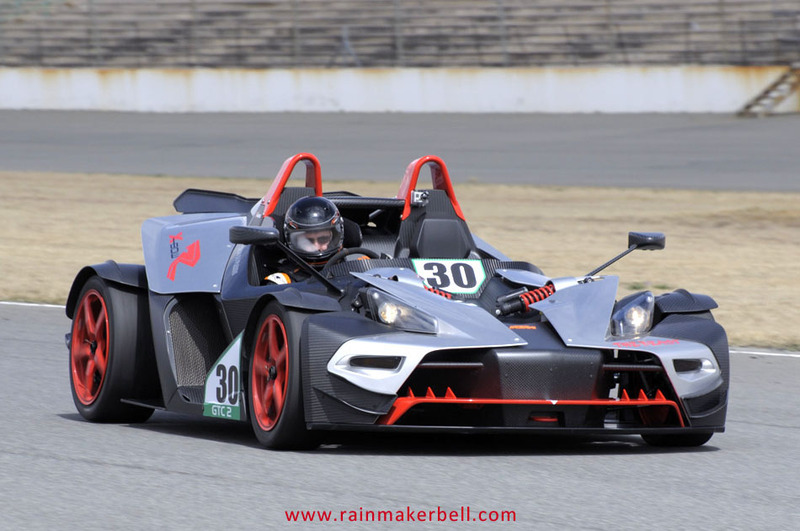 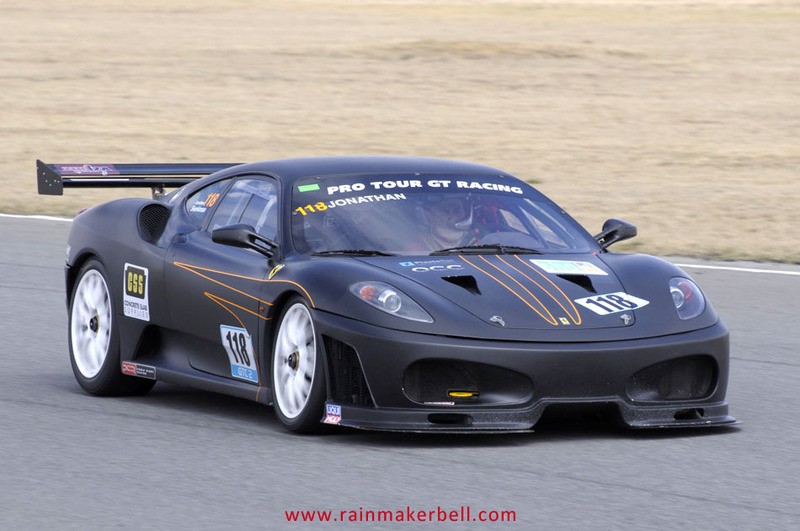 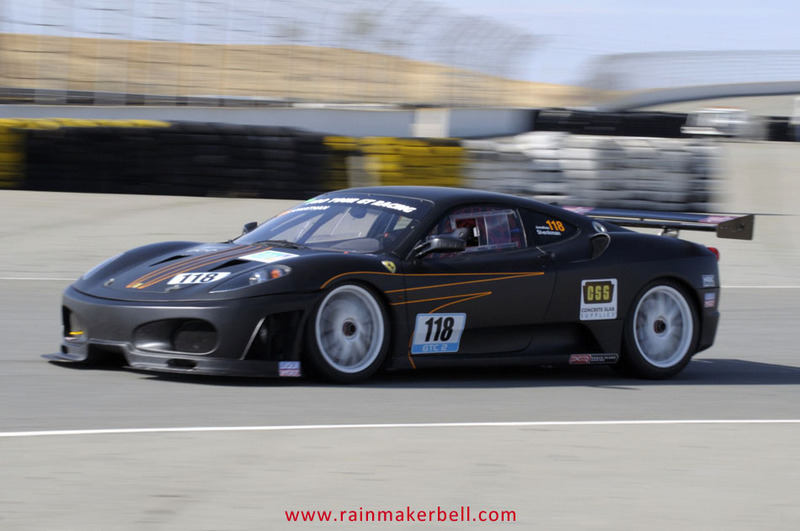 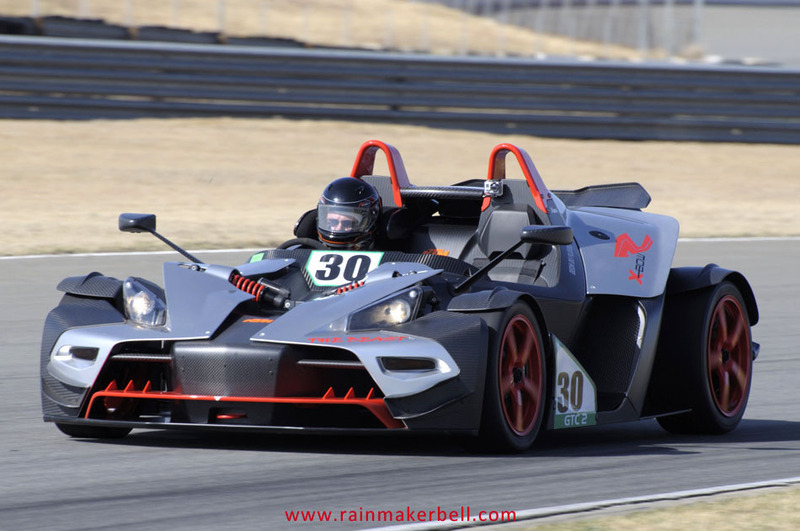 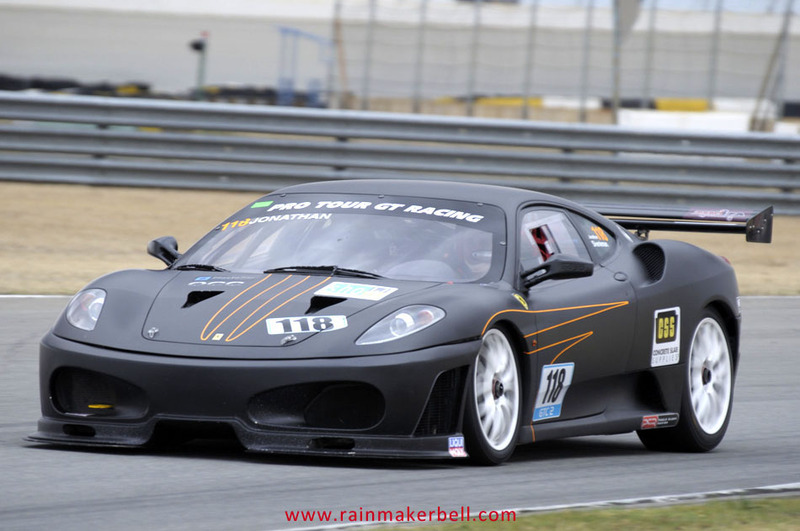 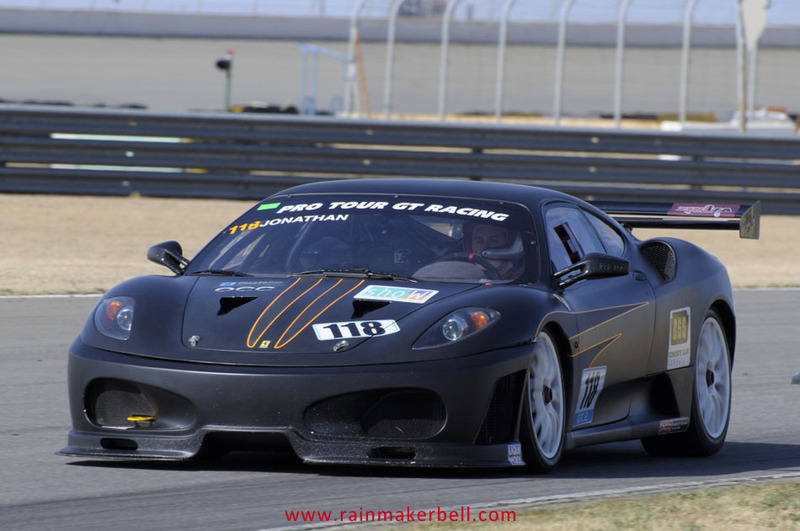 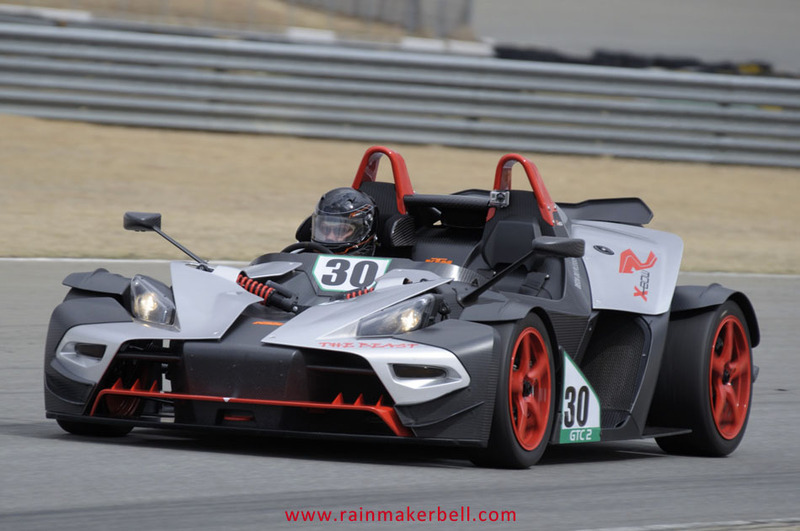 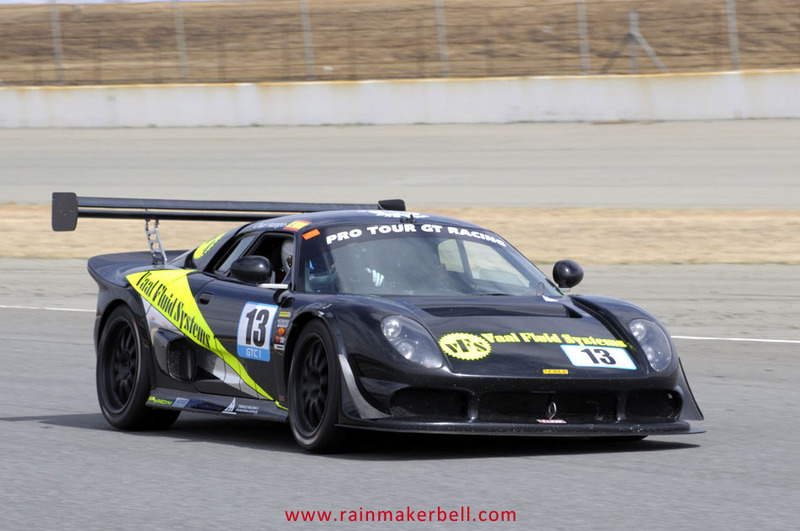 Hopefully Charl Arangies #13 in his Black Axe (Noble M400) will give the rest of the GTC classes—Vernon Bricknell in his ultra-red Porsche, Sun Moodley #11, Andrew Culbert #23, Preyen Moodley #43 and Deon du Plessis in a KTM X-Bow—a run for their money on the 4.24km Phakisa circuit. 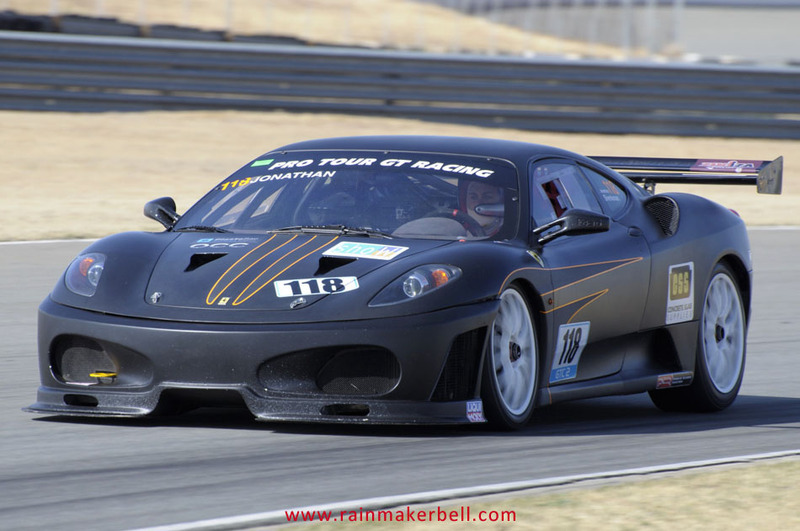 Would Nicky Dicks bring Dorothy (Ferrari F430 Challenge) out to play or will it be the all-white Porsche 911? 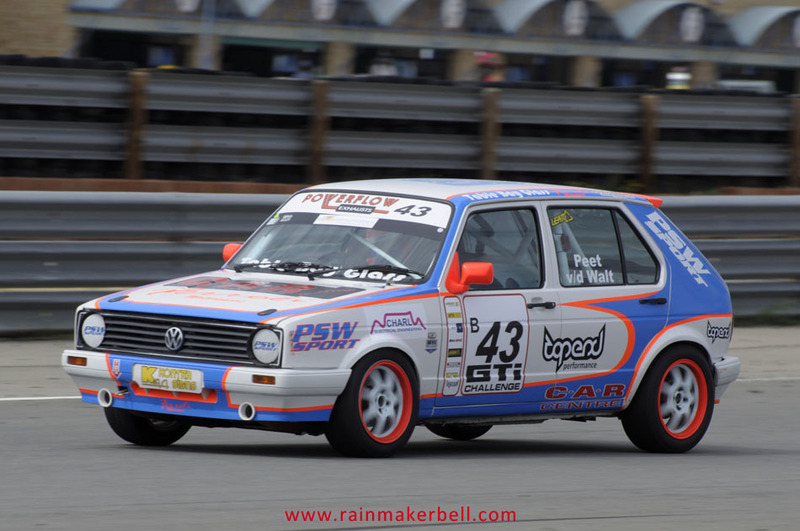 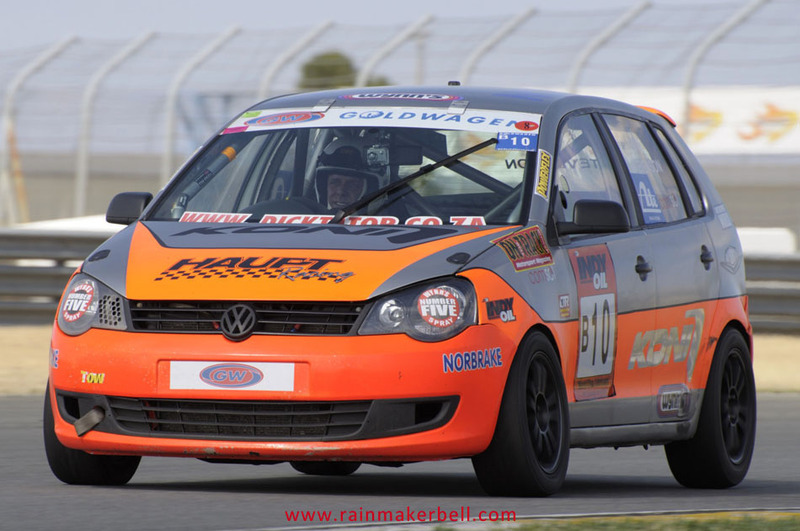 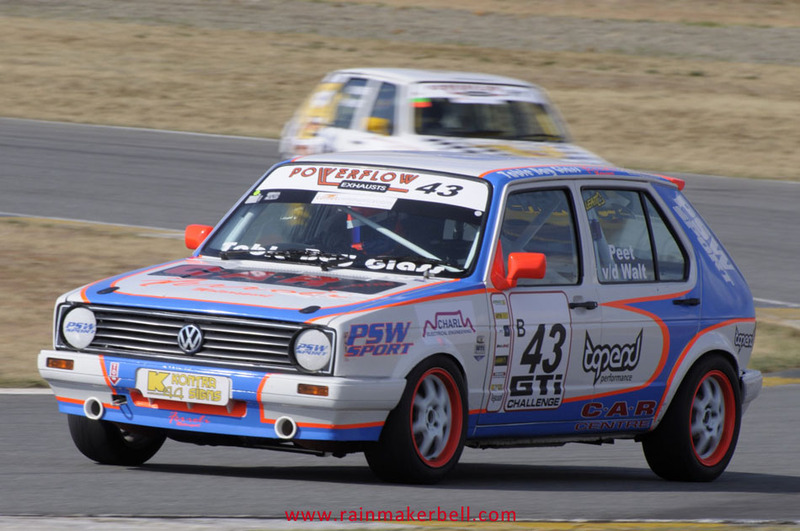 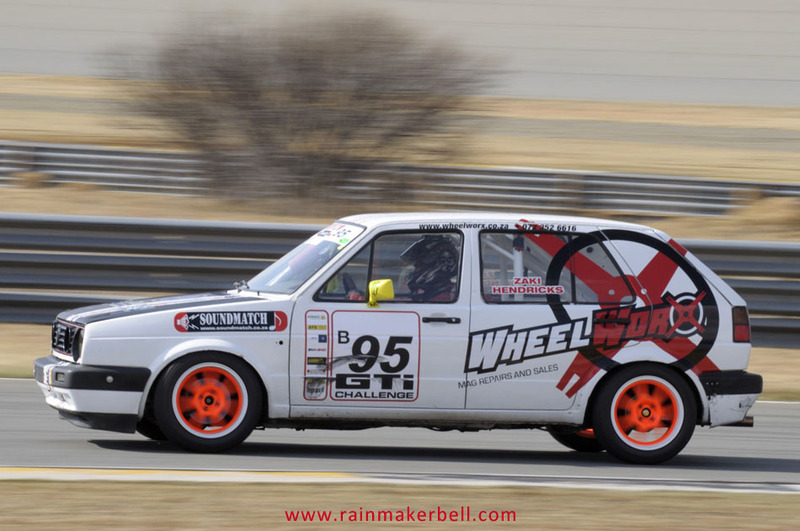 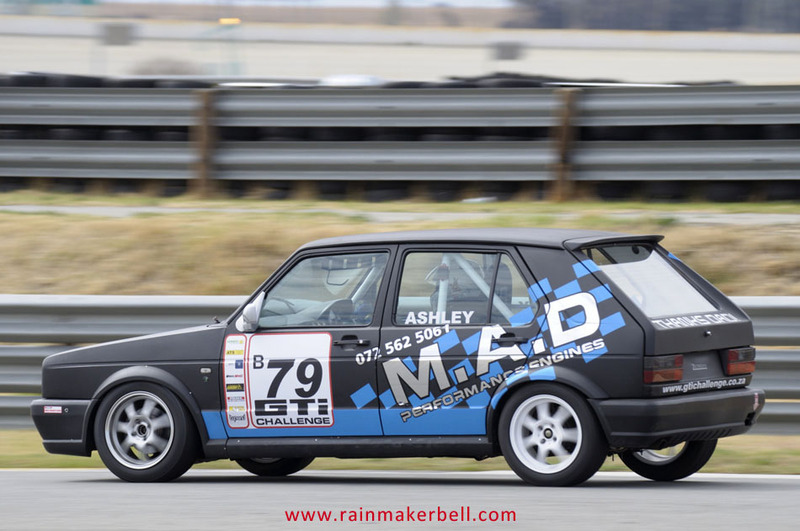 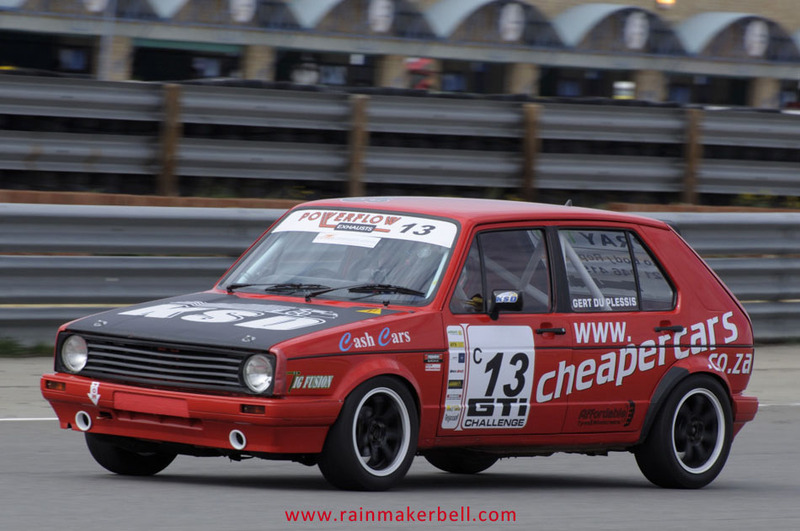 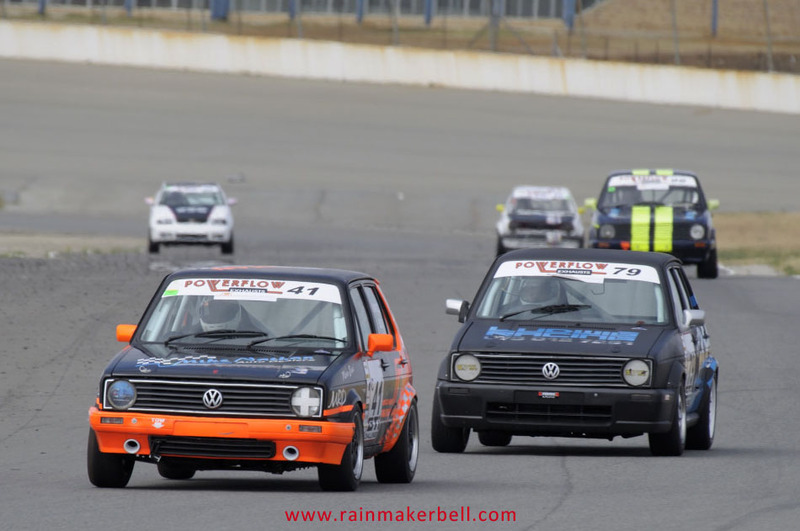 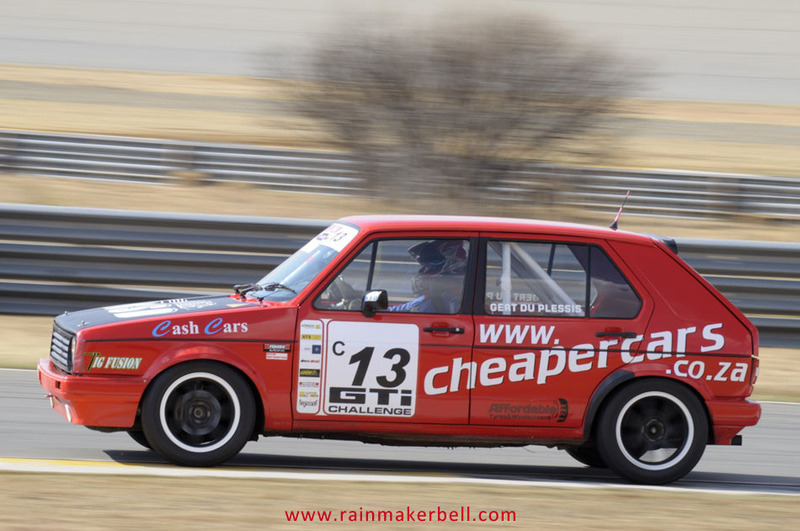 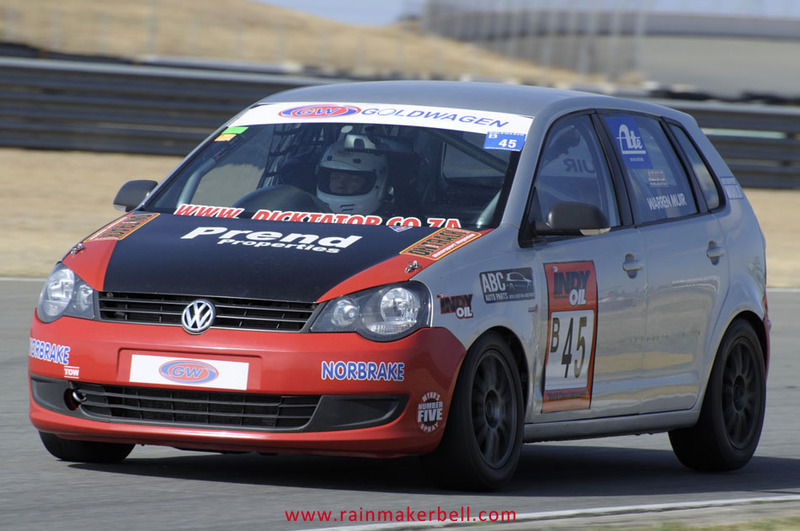 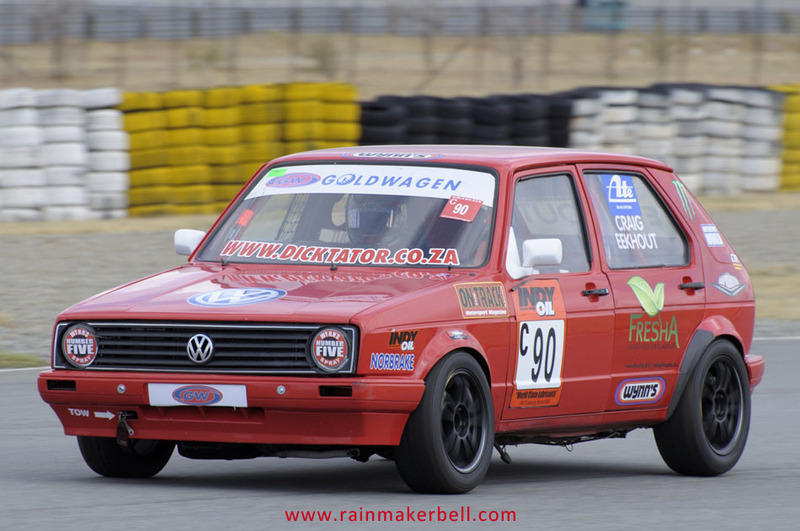 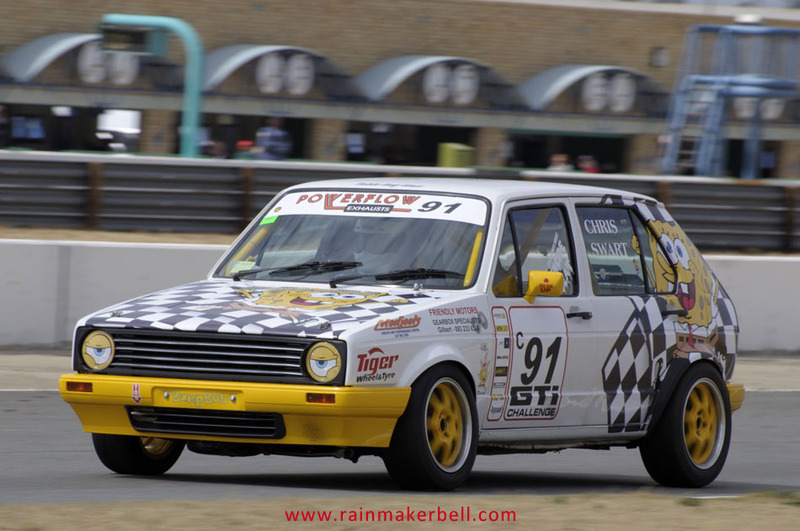 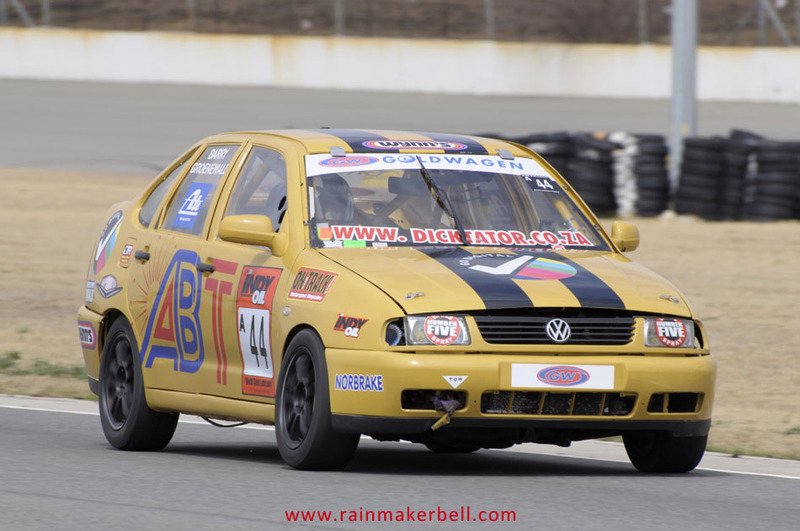 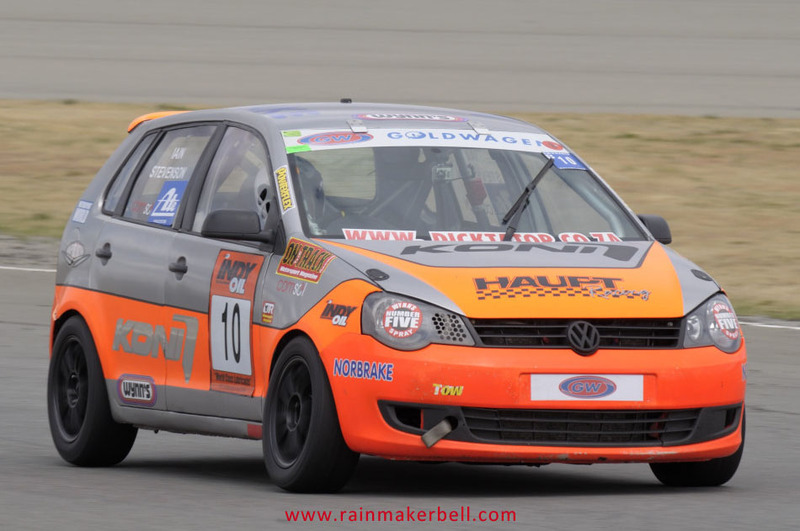 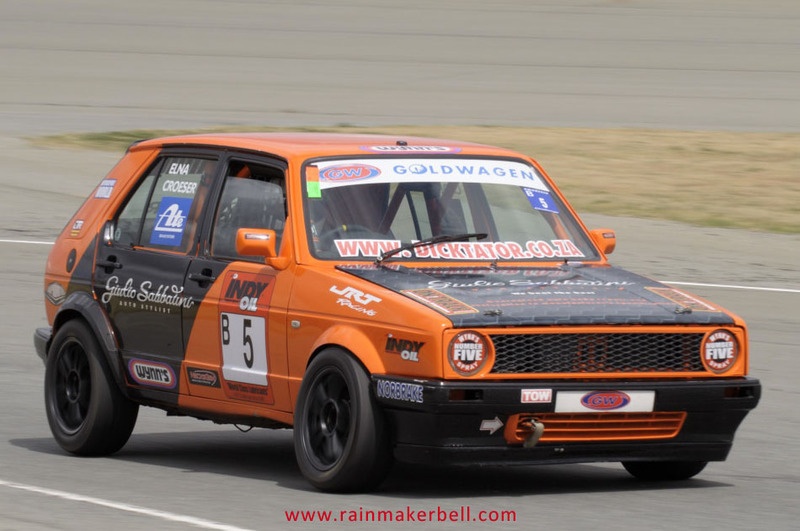 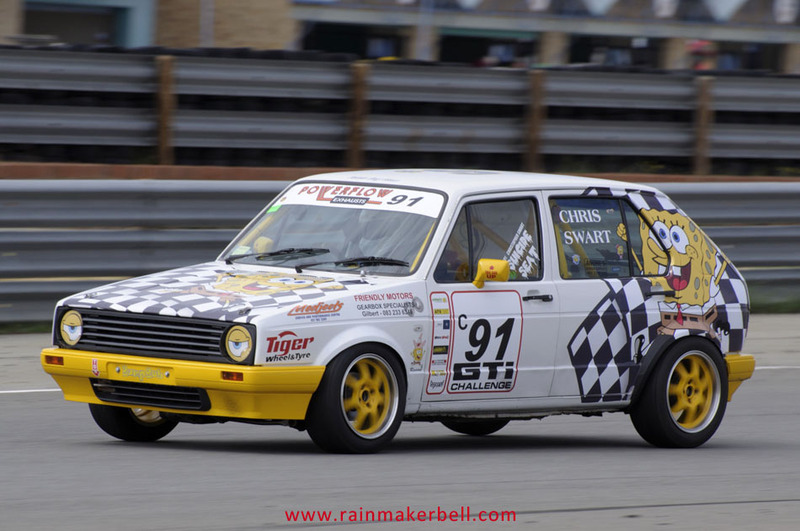 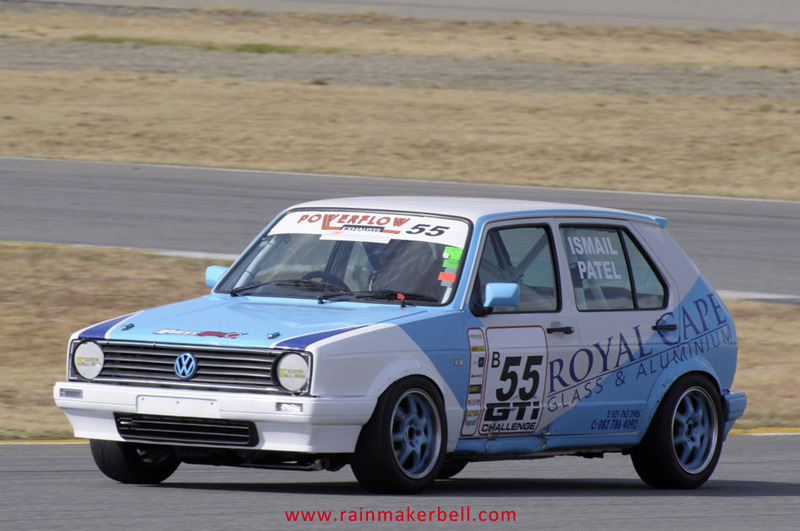 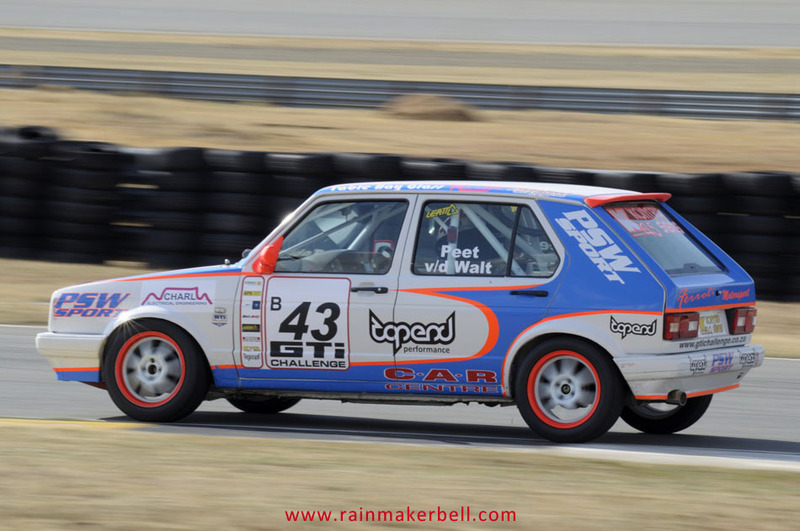 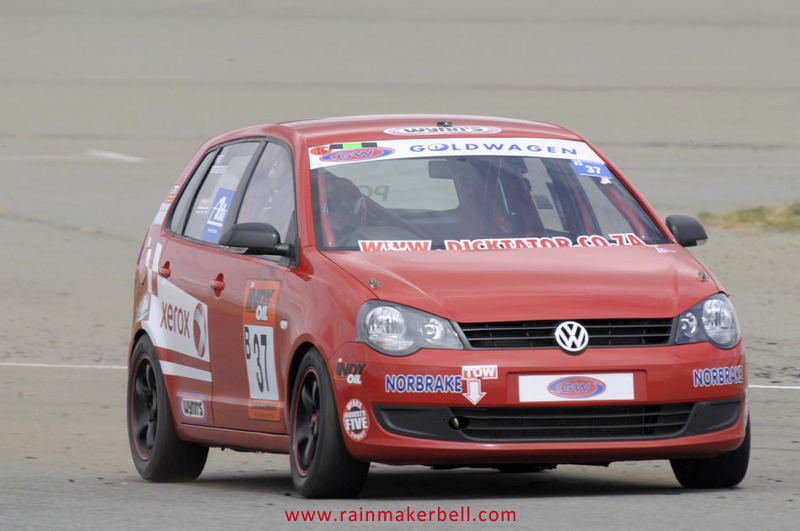 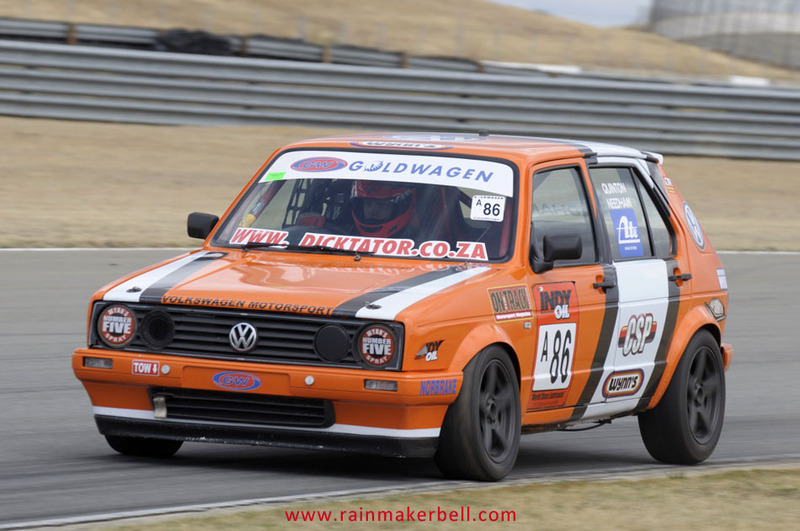 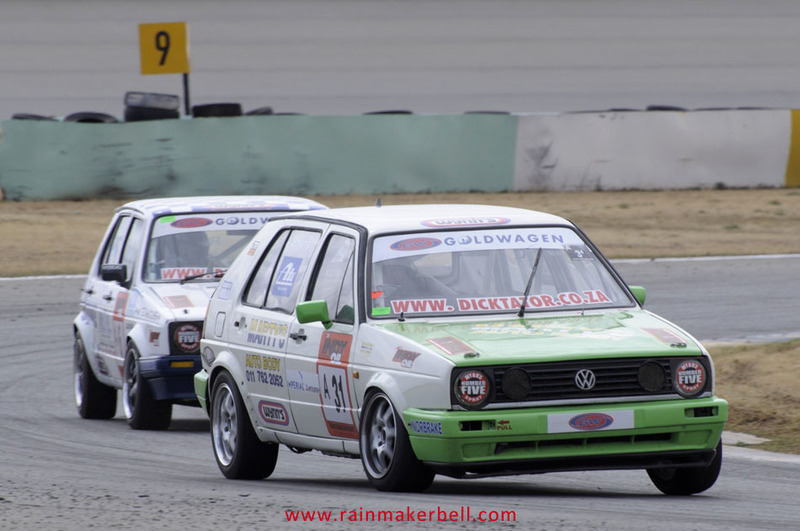 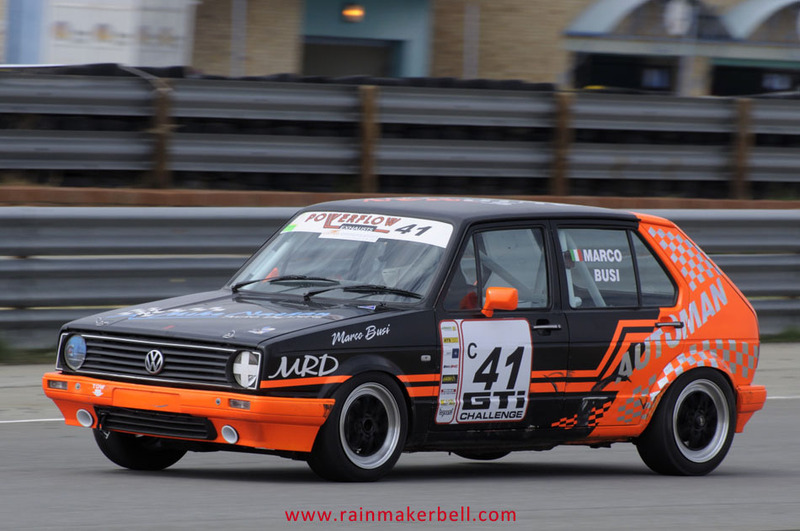 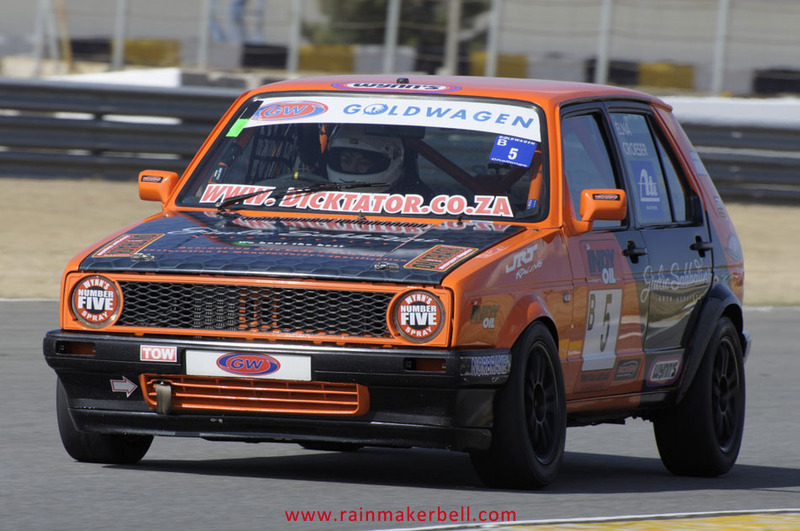 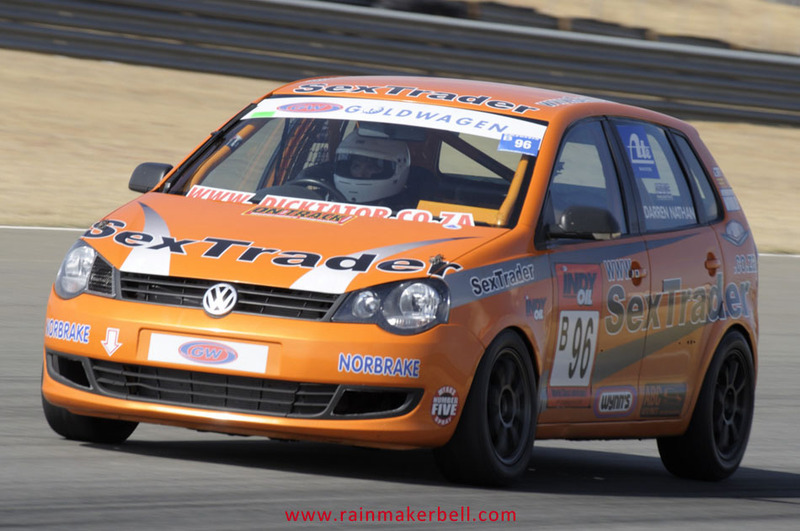 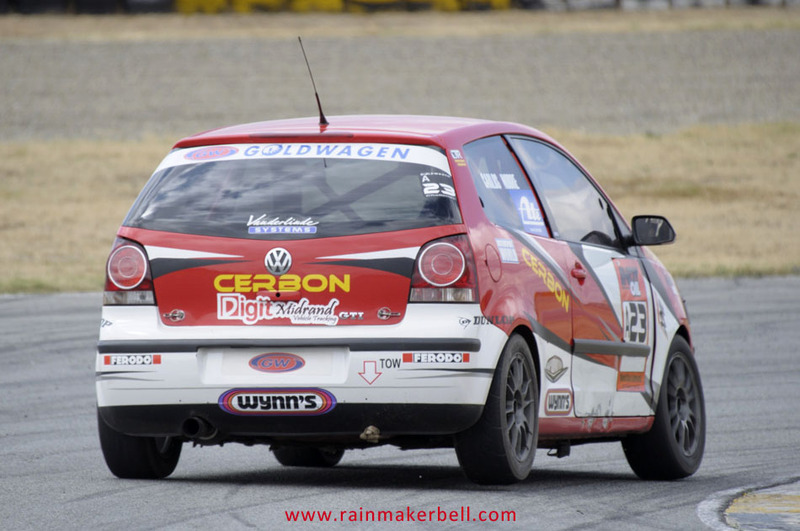 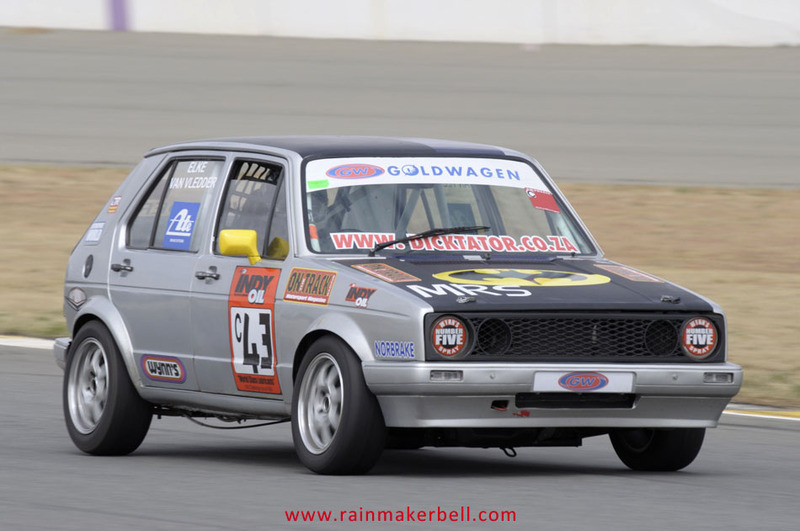 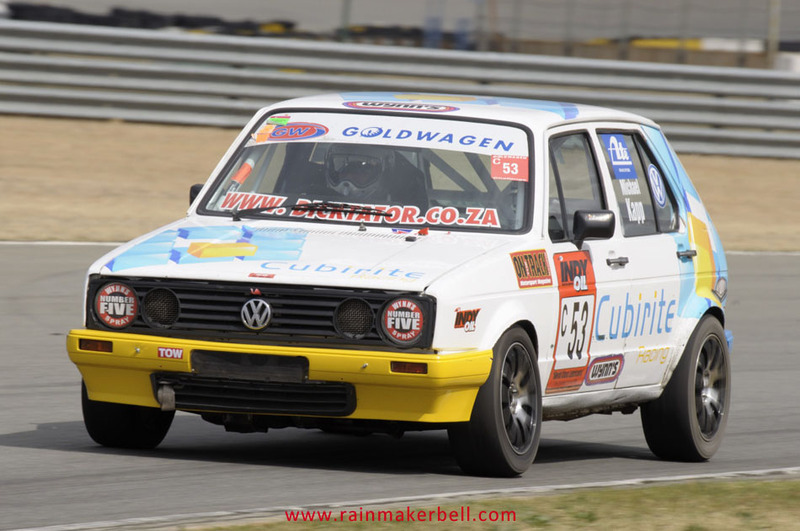 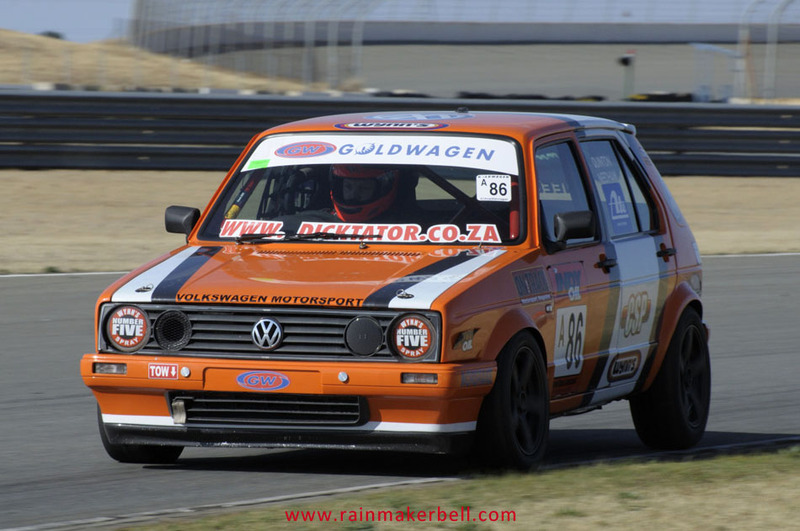 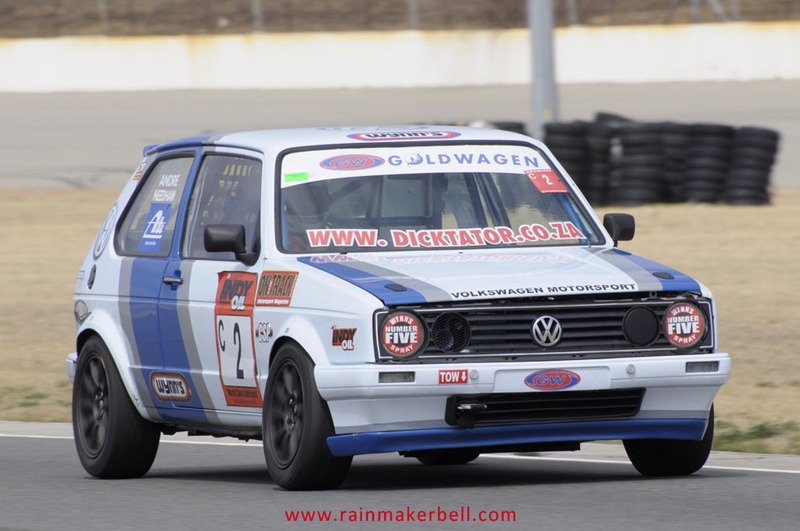 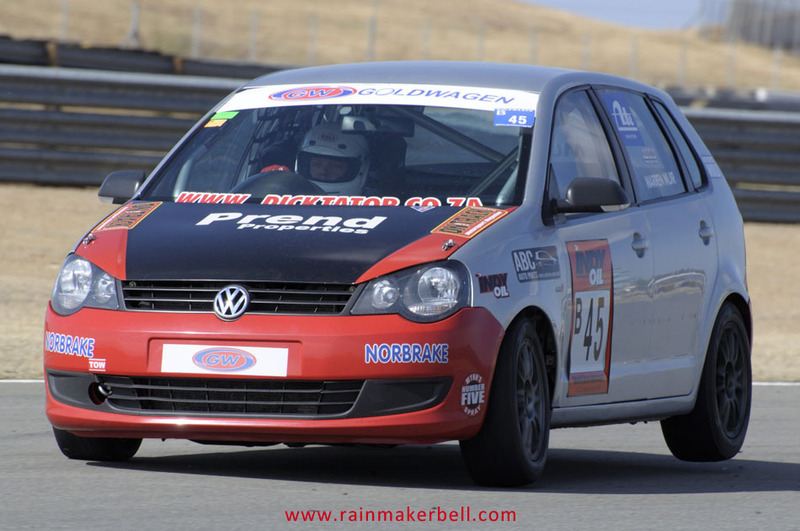 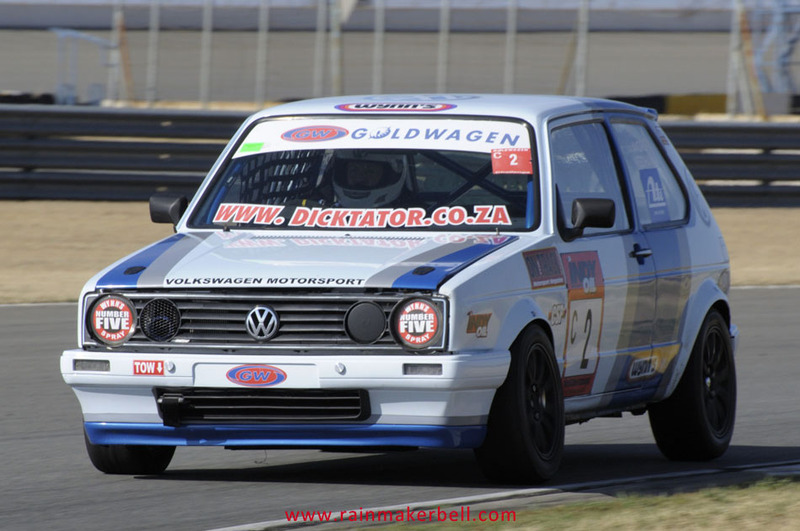 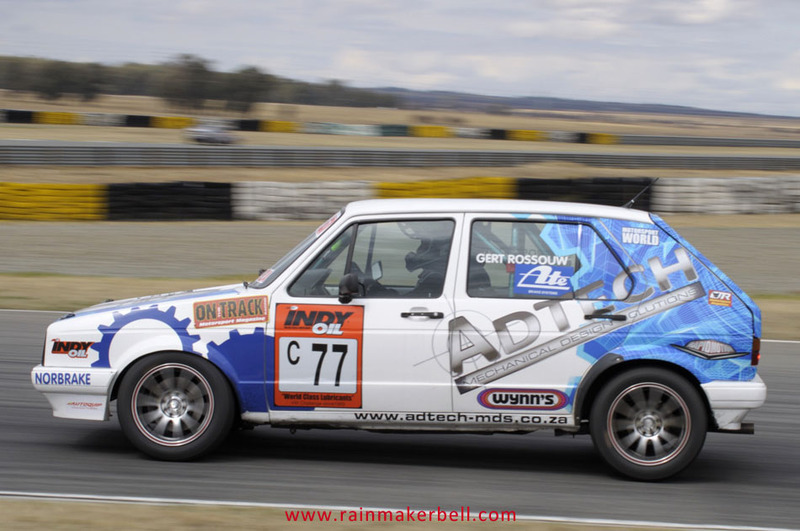 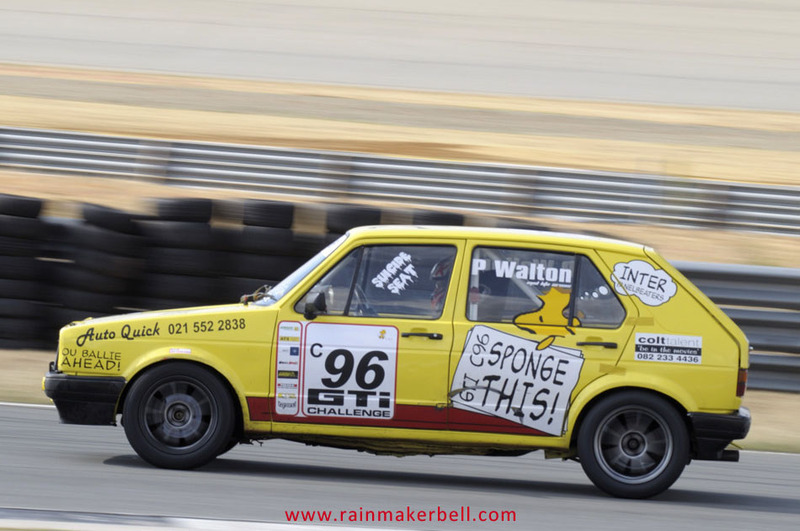 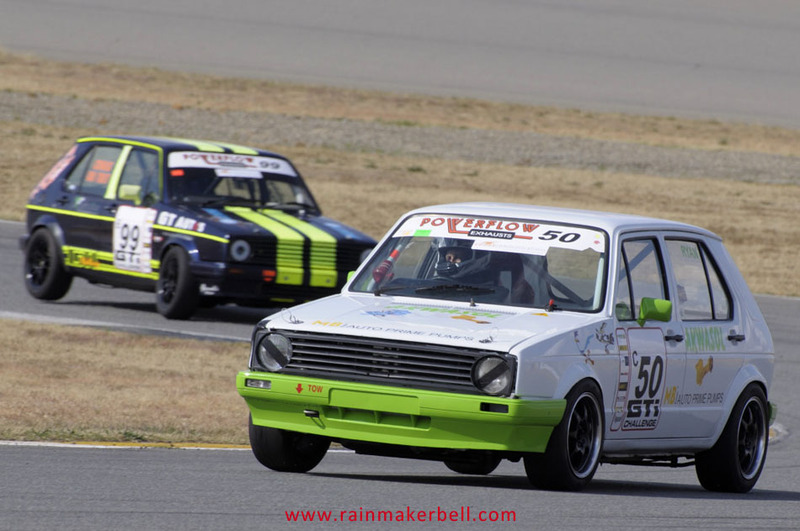 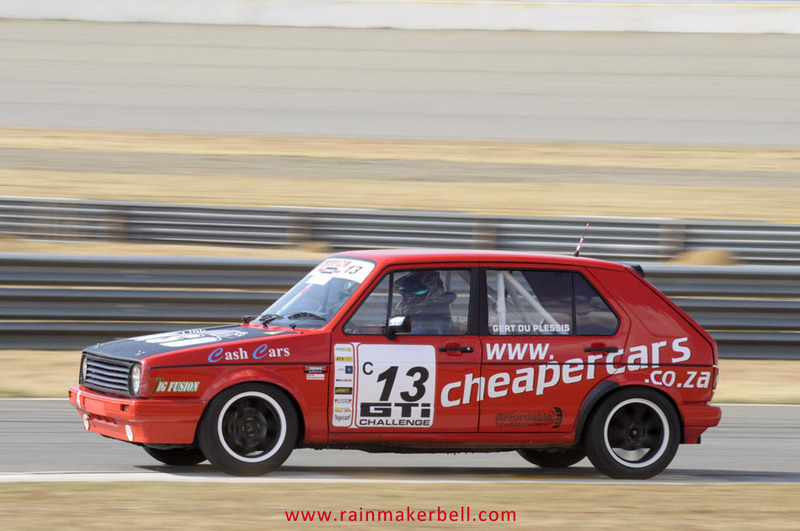 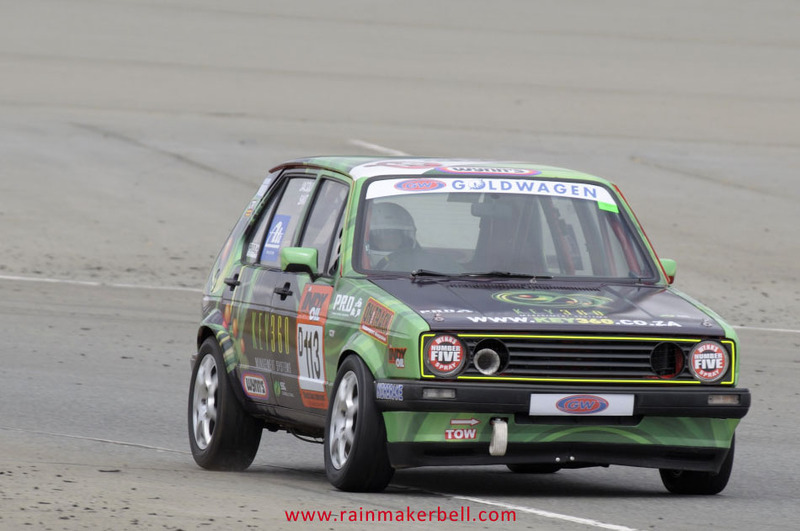 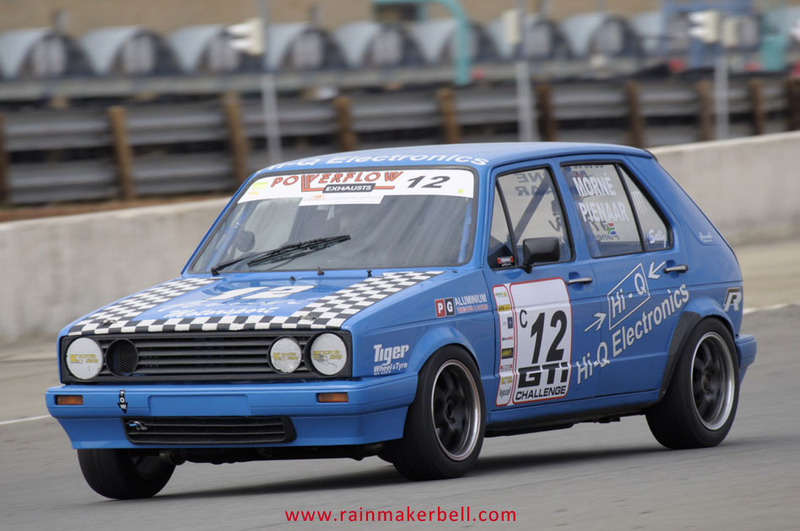 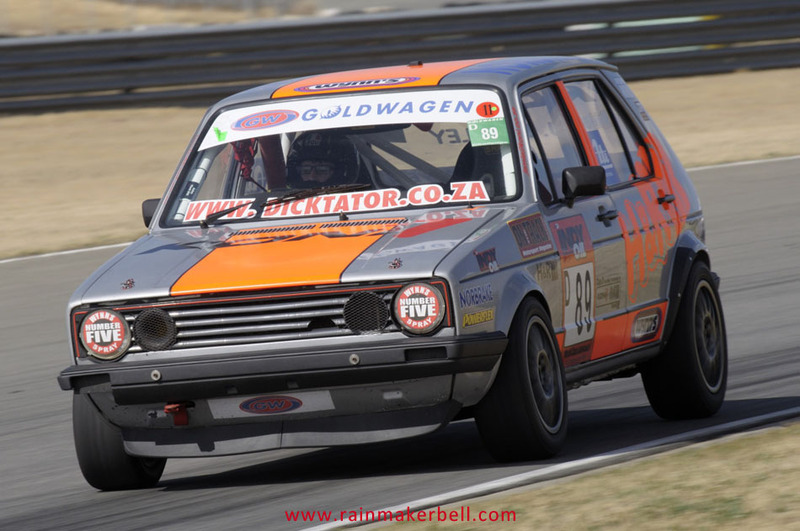 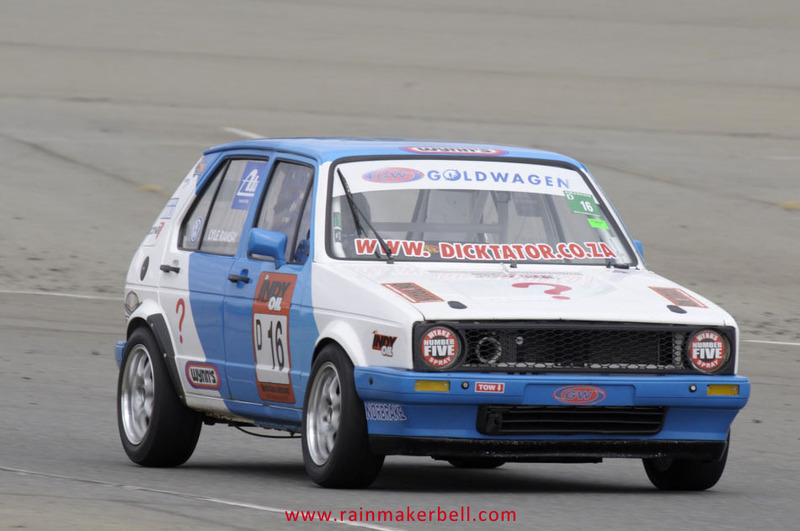 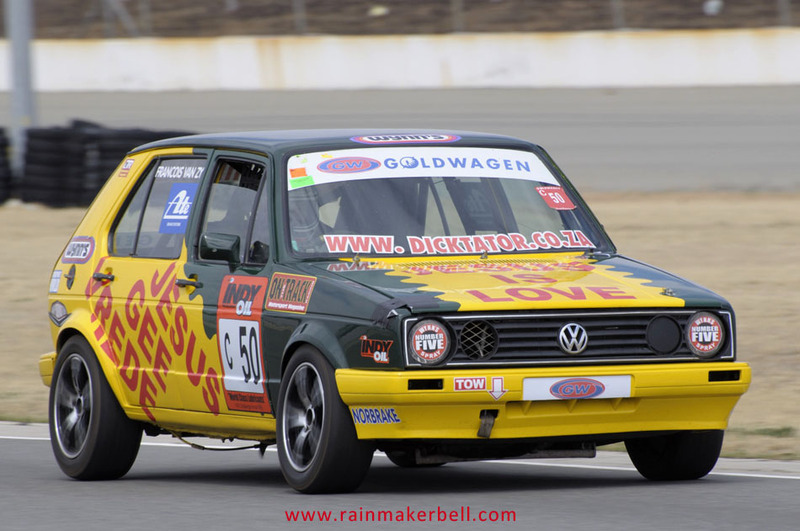 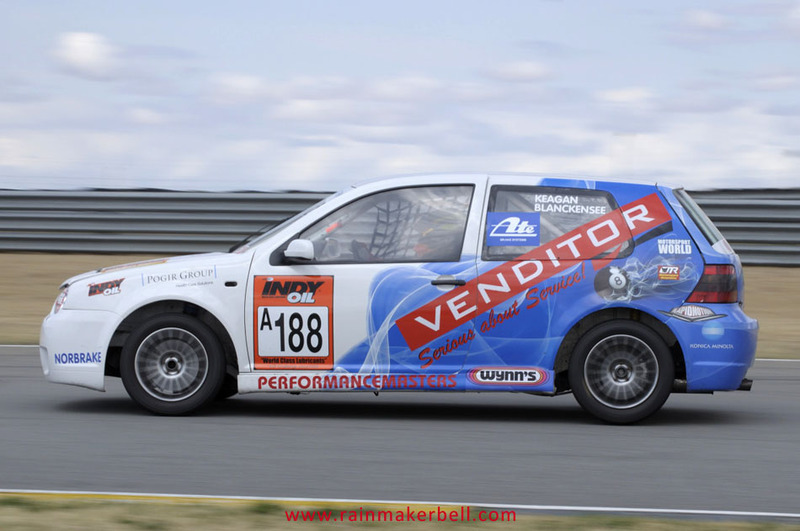 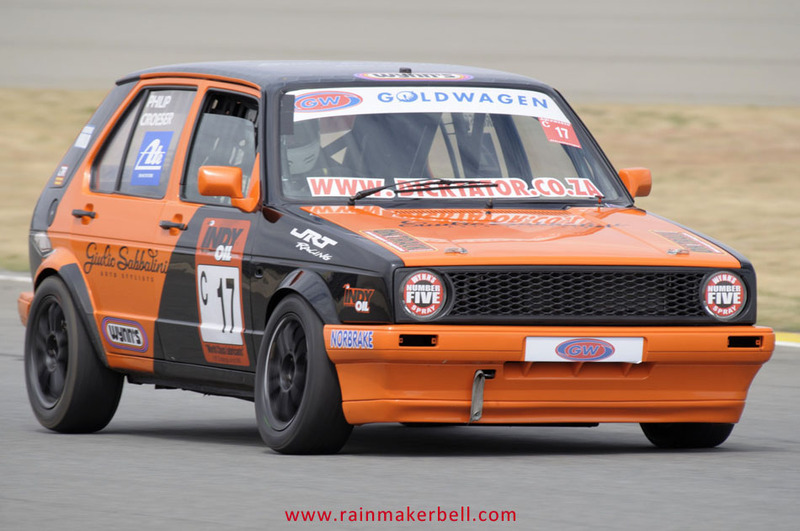 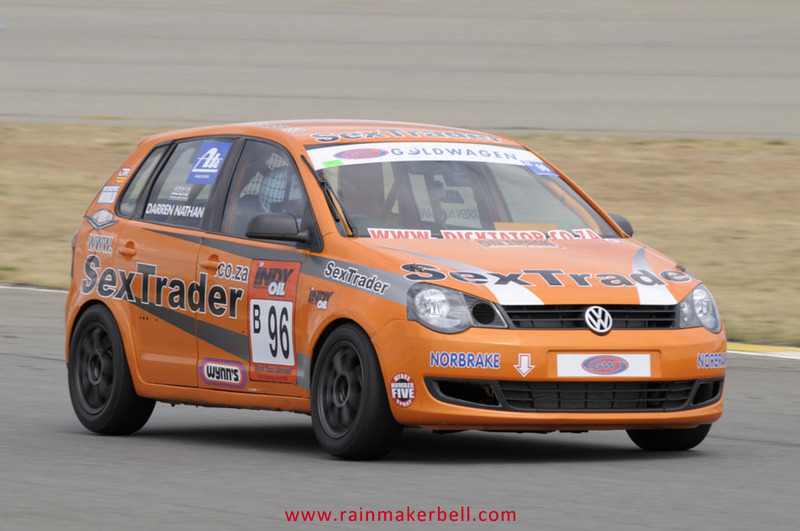 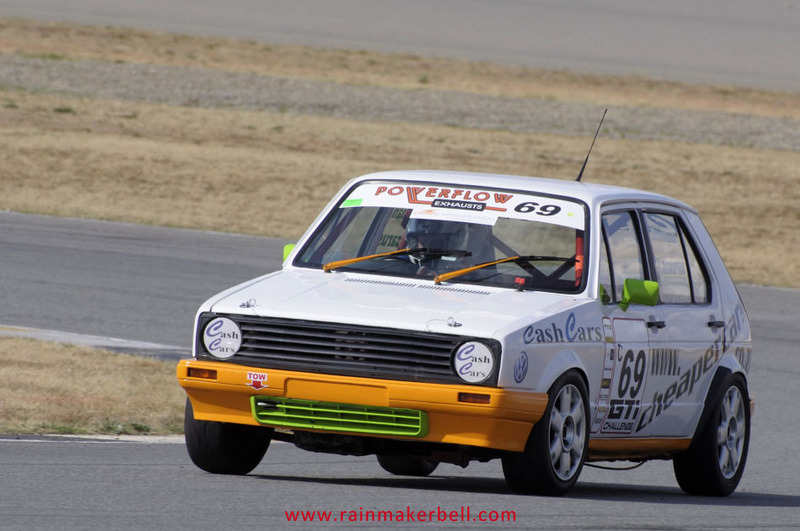 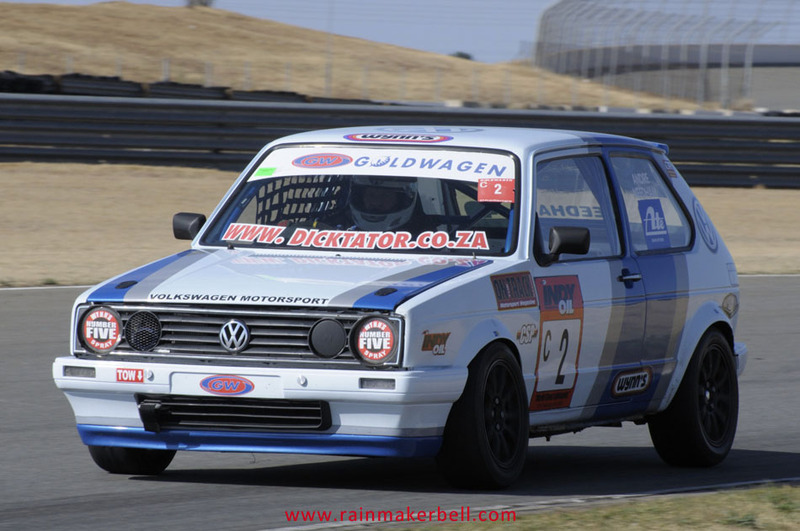 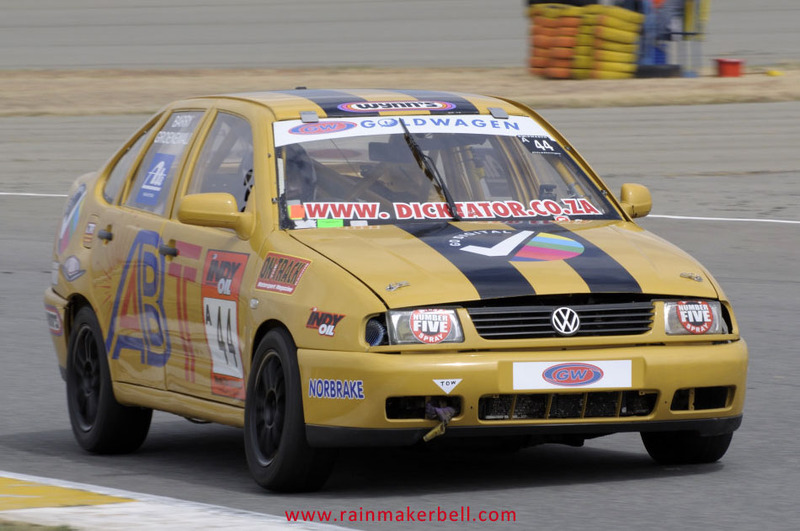 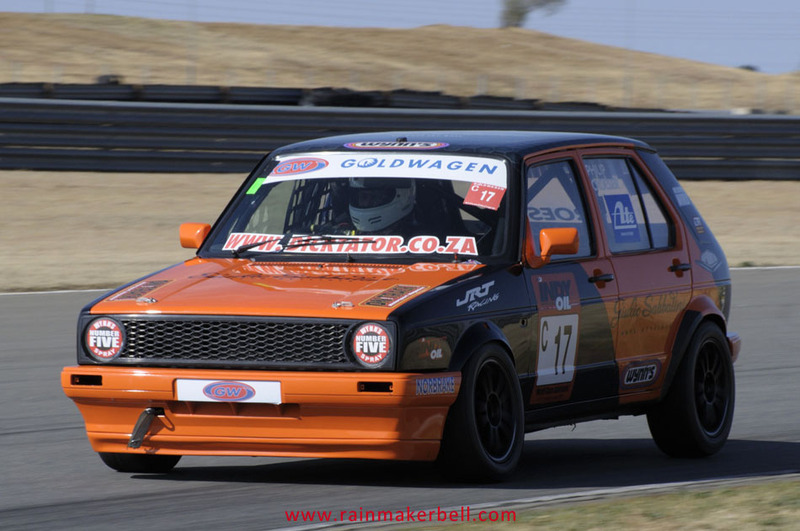 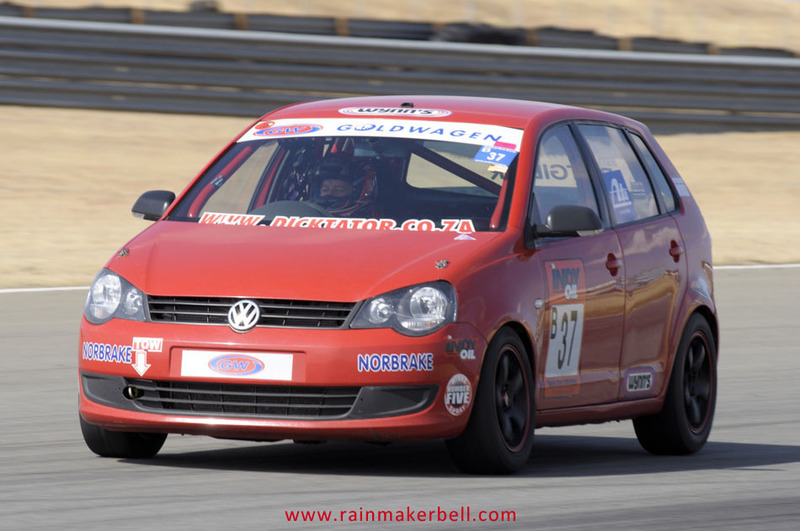 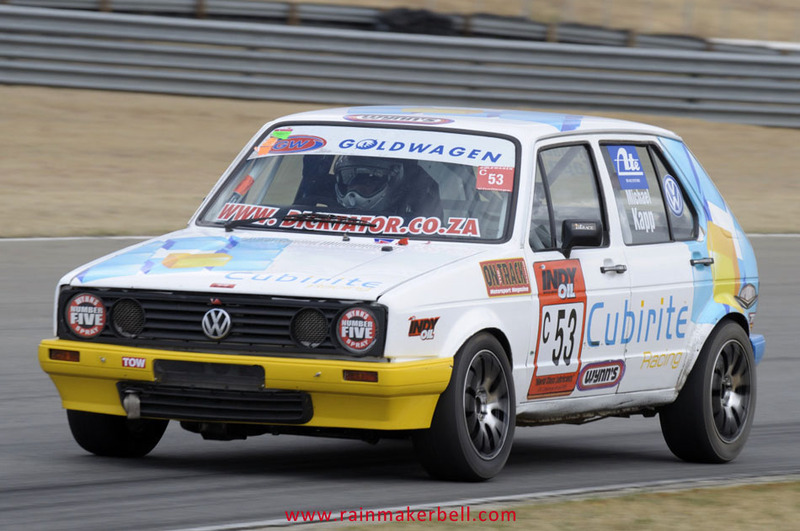 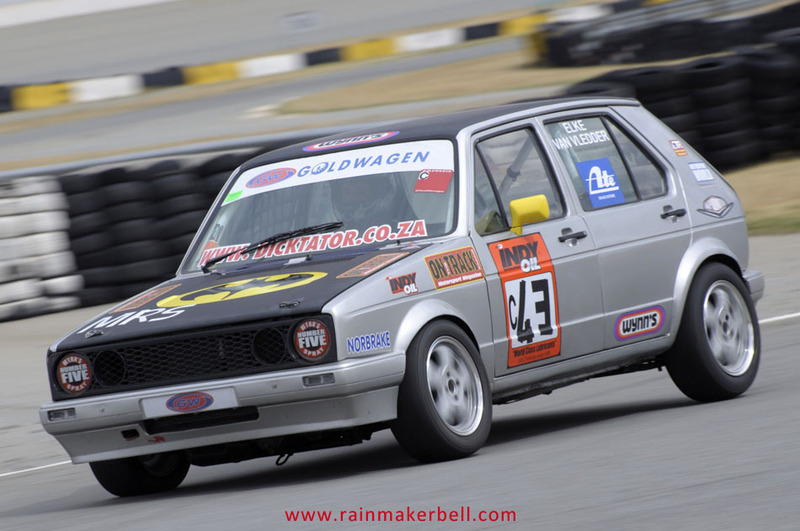 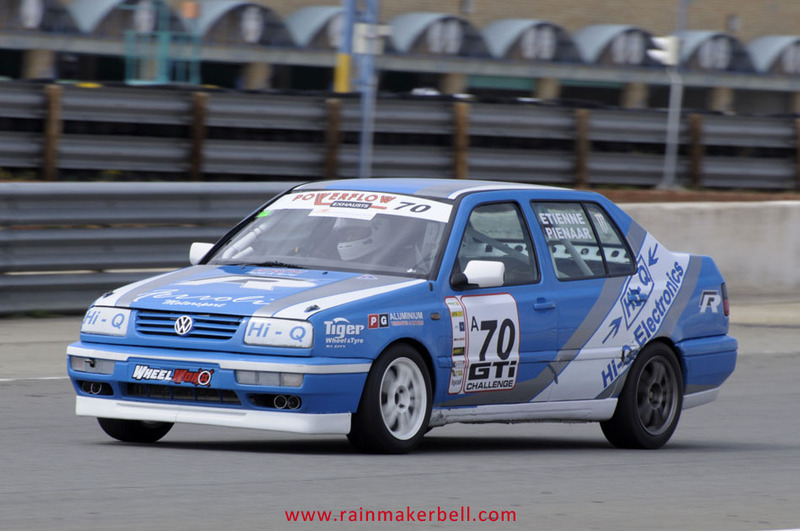 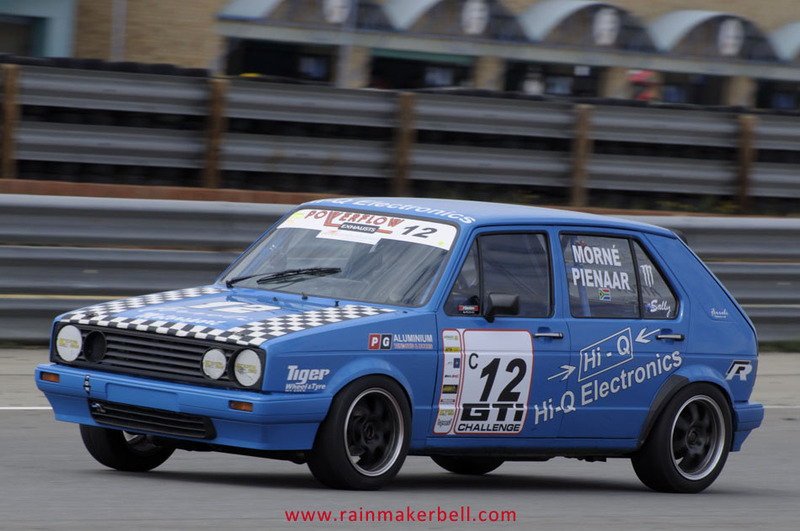 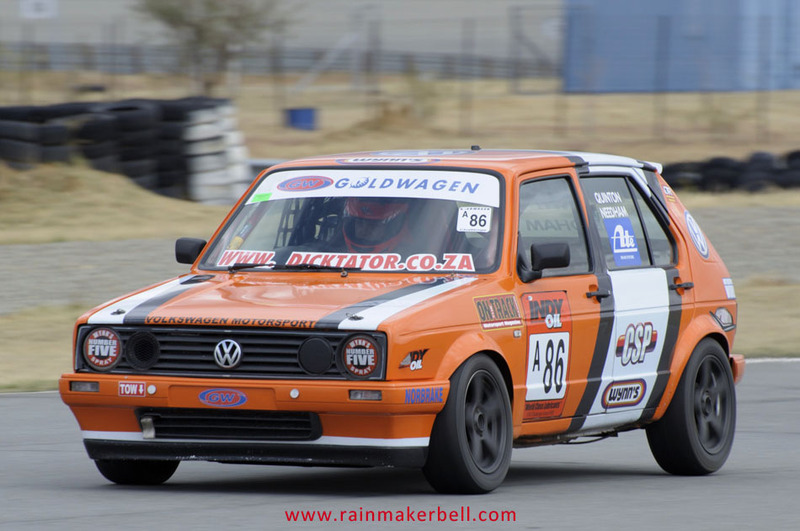 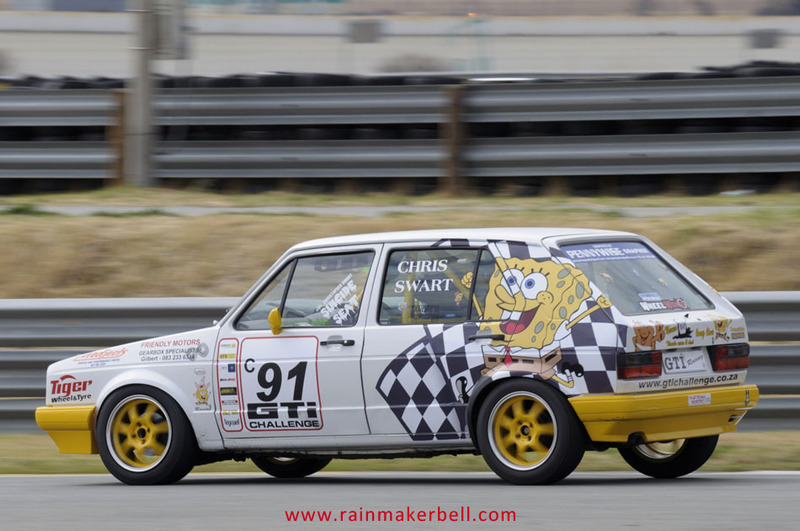 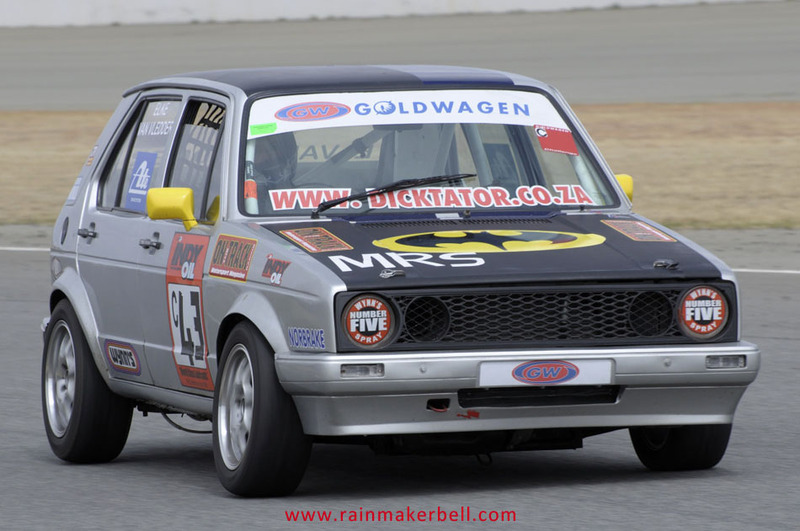 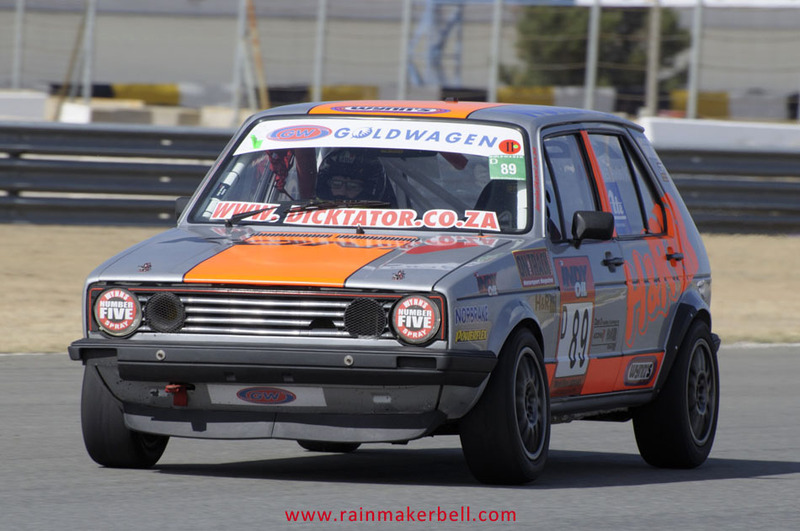 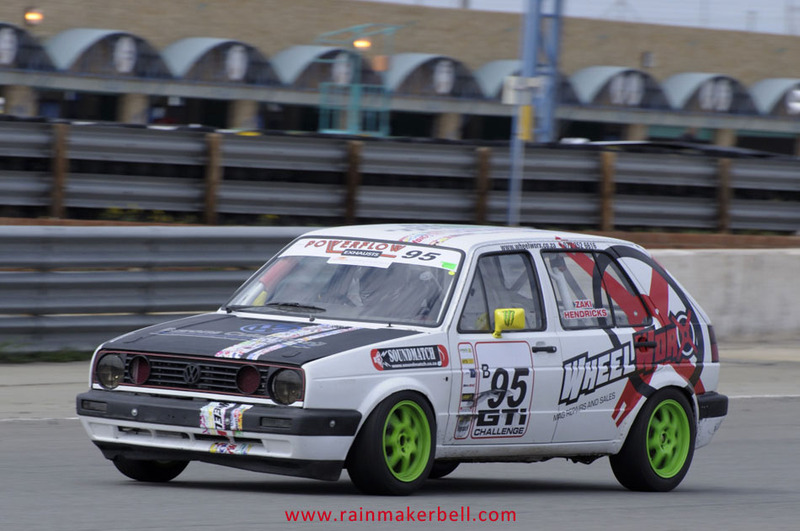 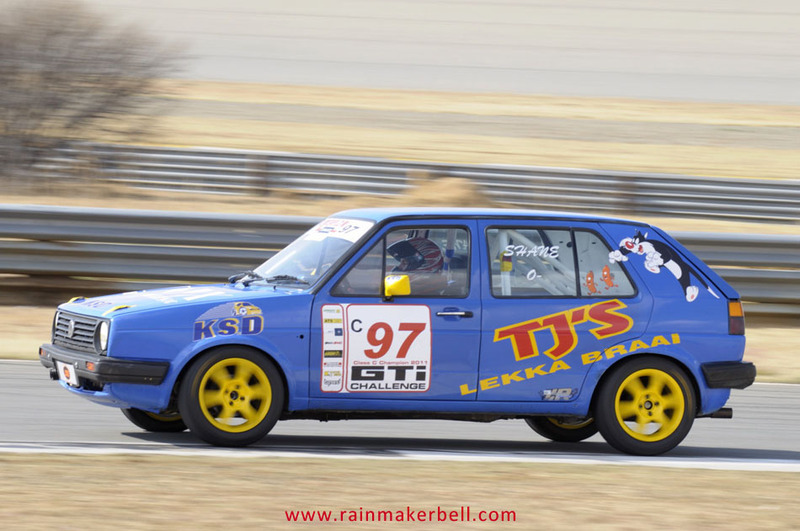 Since the Cars from Mars will no longer be entertaining us in the Pro Tour Series, the organisers had to find a space-filler and I was actually curious to see what the invitational GTi challenge (a Cape based motorsport category) will produce on the long Phakisa track. 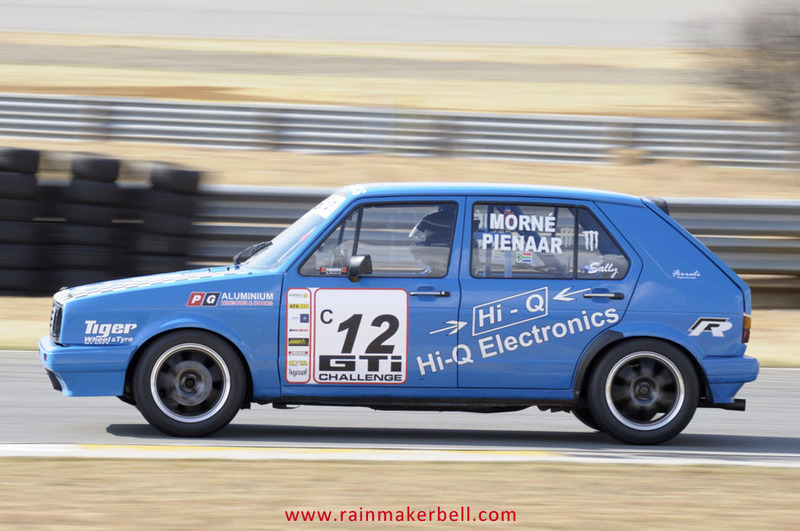 ‘Welcome race fans to the capital of South African motorsport,’ states the billboard at the entrance to Phakisa Freeway. 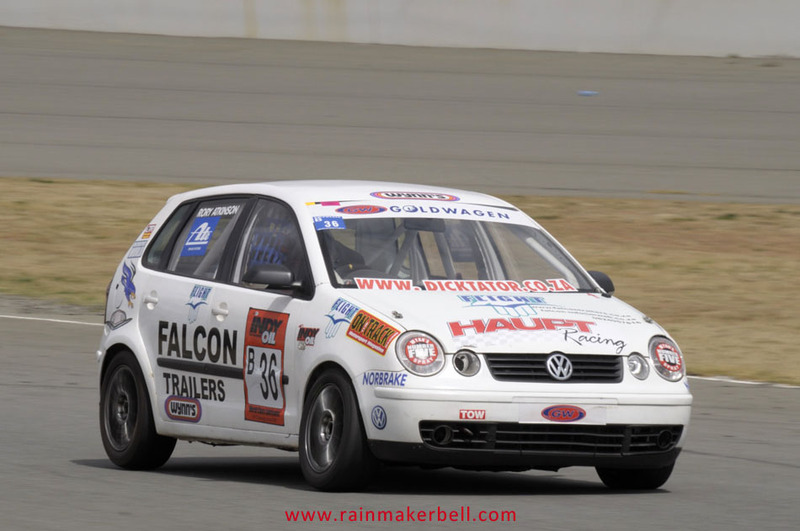 Swallows nesting under the bridge, stretched their wings in a happy dance and I felt like a long lost son. 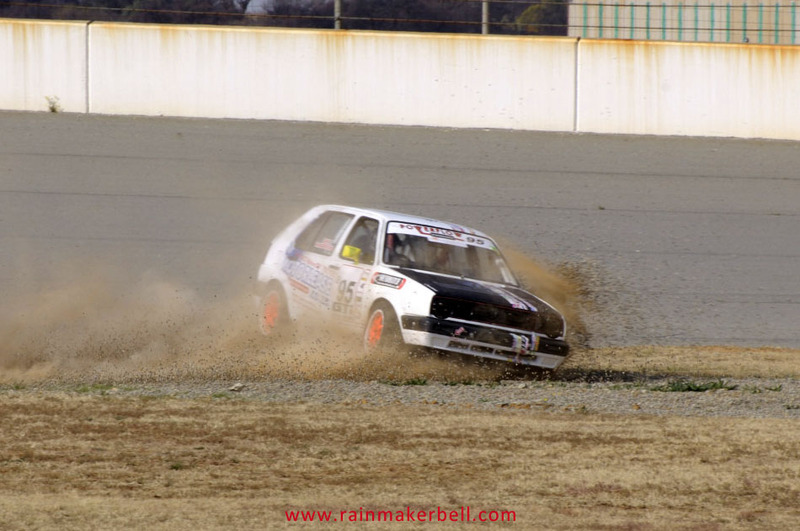 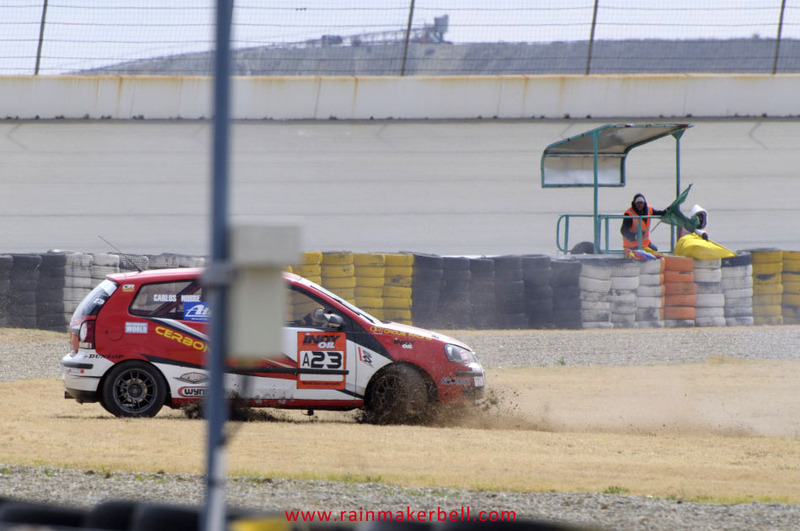 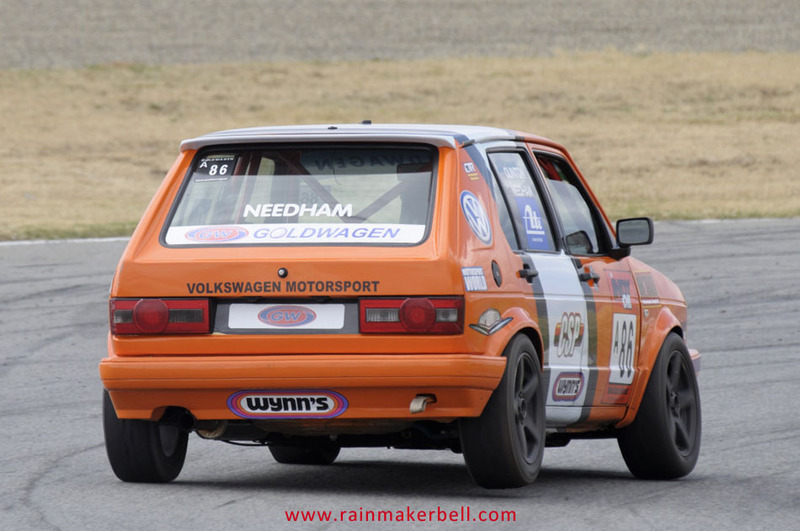 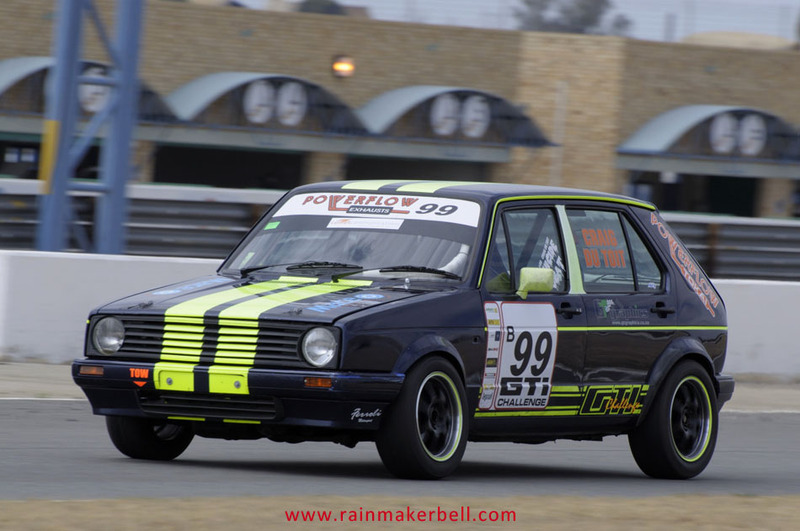 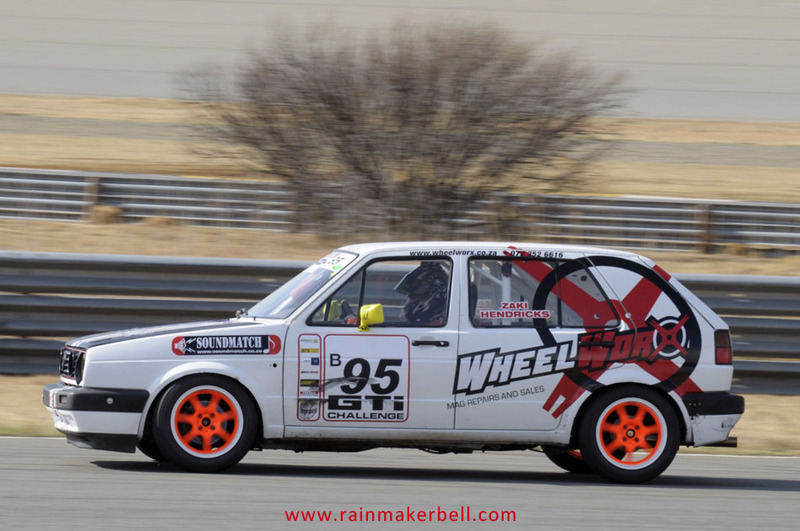 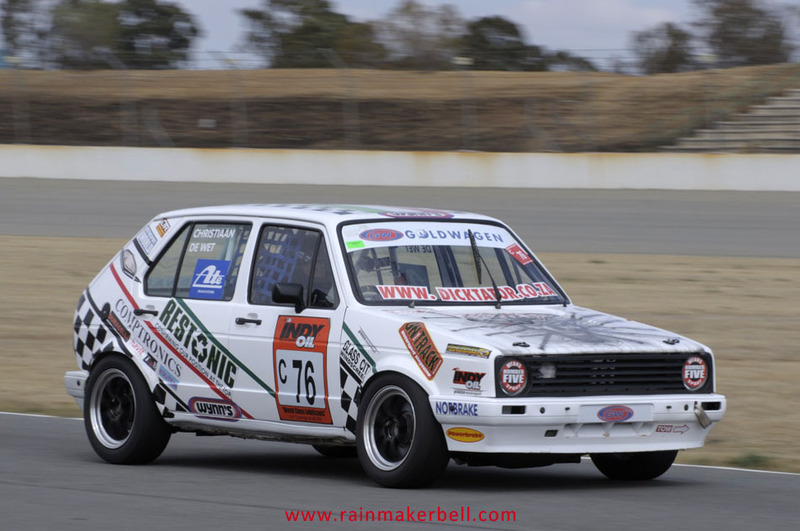 Fortunately the slippery when wet roads did not stretch into Welkom and even though it was cold and overcast the dry conditions at the track was a relief. 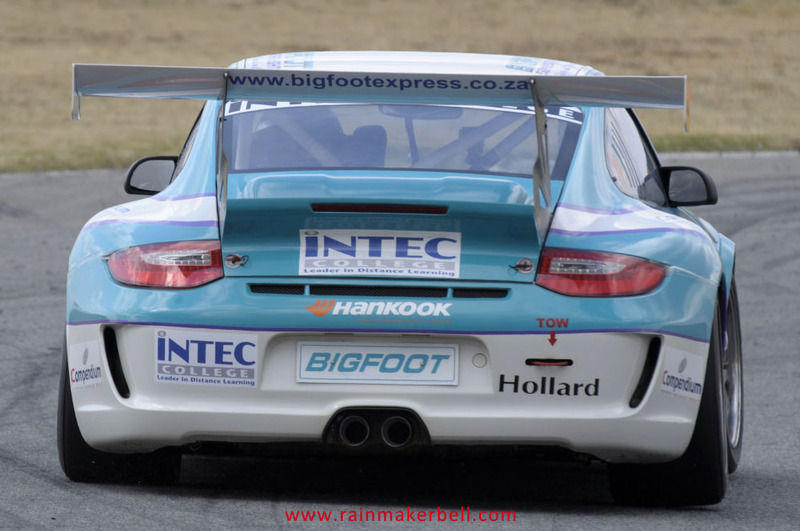 Words & Photos: Adriaan & Martine Venter (Pro Tour Series, Phakisa Freeway, South African Motorsport, 2012/09/07, Practice Session, 122 images) Main Image: Sun Moodley #11, Porsche 911 997 GT3 Cup, GT Challenge.